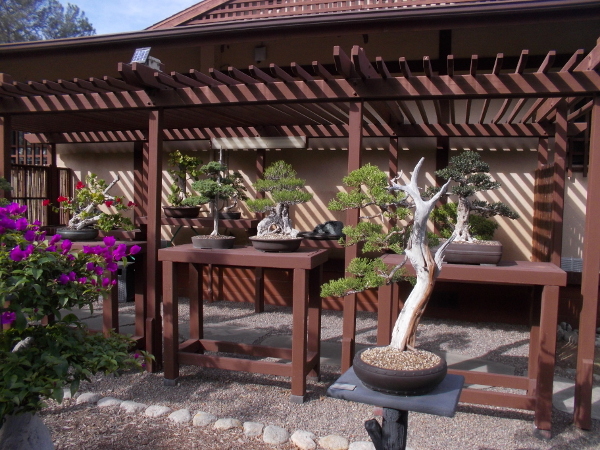 japan – Beautiful Balboa Park! 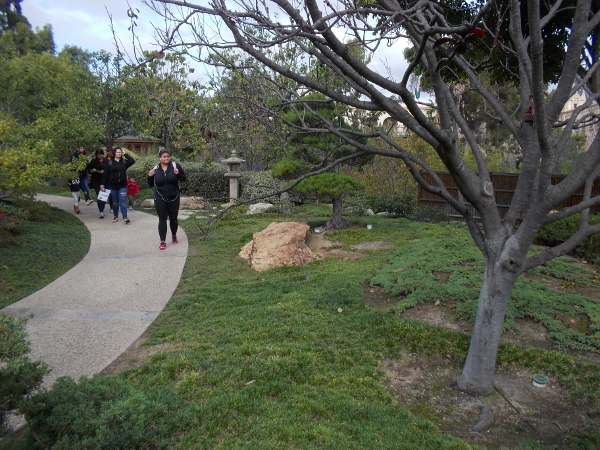 The Peace Trees of the Japanese Friendship Garden. 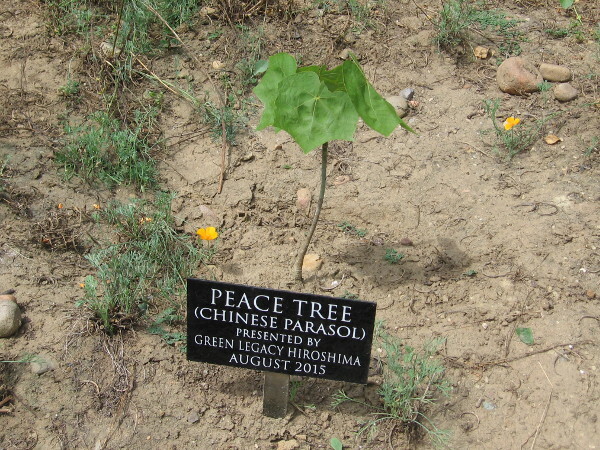 Chinese Parasol Peace Tree, presented to the Japanese Friendship Garden by Green Legacy Hiroshima, August 2015. 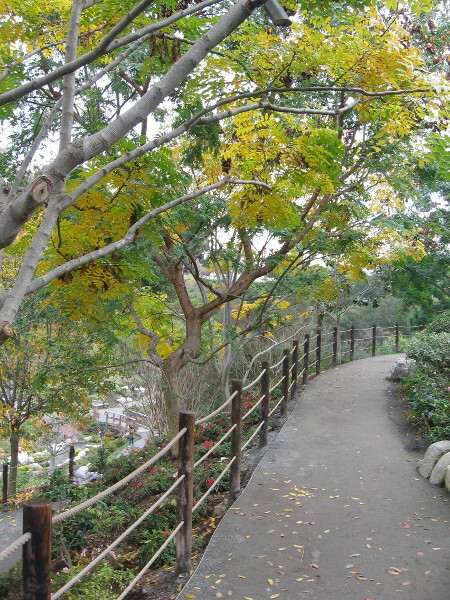 The Japanese Friendship Garden is home to a variety of inspiring Peace Trees. 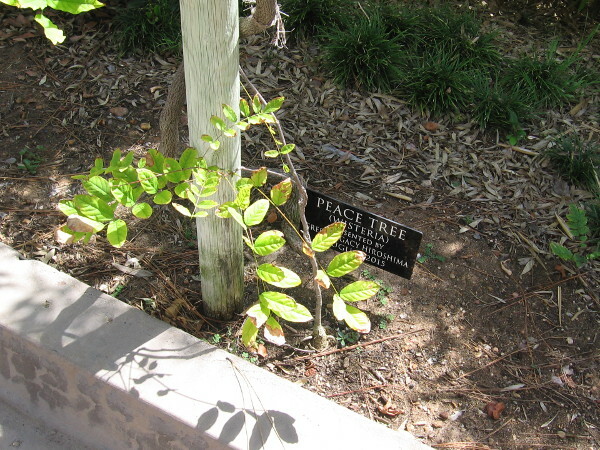 These Peace Trees are descendants of trees that miraculously survived the Hiroshima A-Bomb during World War II. The trees were presented by Green Legacy Hiroshima, an organization that spreads the seeds and saplings of Peace Trees to gardens around the world. They are symbols of hope, and the resilience of life, and the victory of human friendship, understanding and peace. Here are some photos collected over the past couple months. May these Peace Trees grow and thrive in beautiful Balboa Park, where people come together to celebrate the good of humanity. 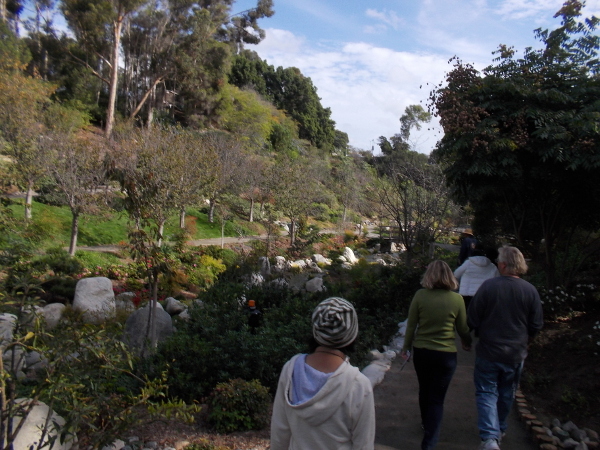 People walk through the profound beauty of the Japanese Friendship Garden in San Diego. 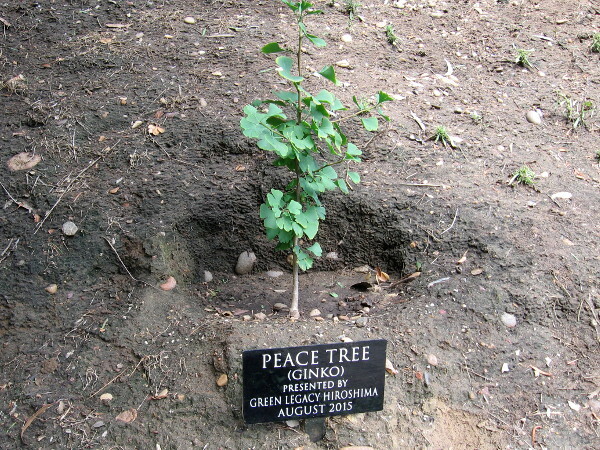 Ginko Peace Tree, presented to the Japanese Friendship Garden by Green Legacy Hiroshima, August 2015. 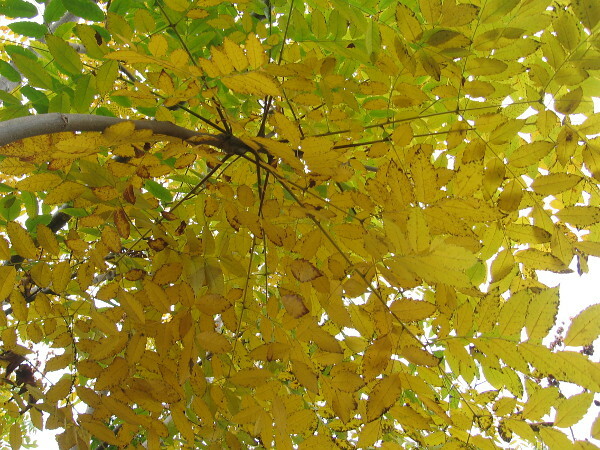 Wisteria Peace Tree, presented to the Japanese Friendship Garden by Green Legacy Hiroshima, August 2015. 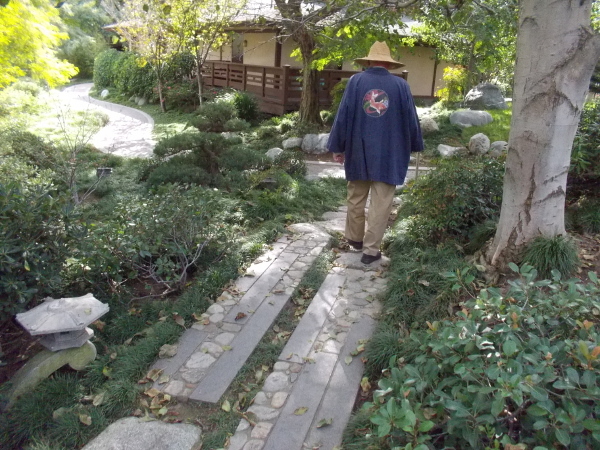 A walk through the Lower Garden of the Japanese Friendship Garden. 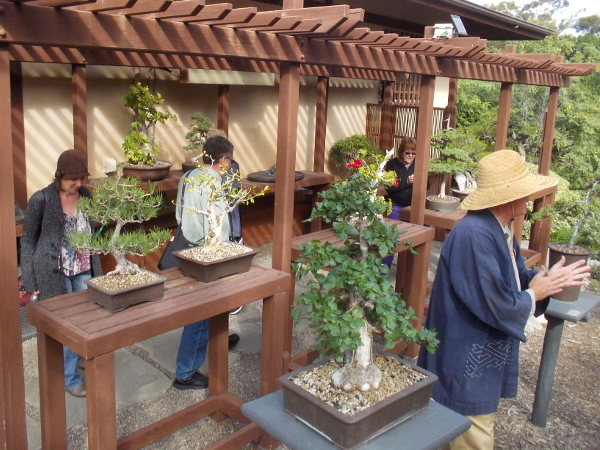 Tending to small bonsai trees in the Upper Garden. 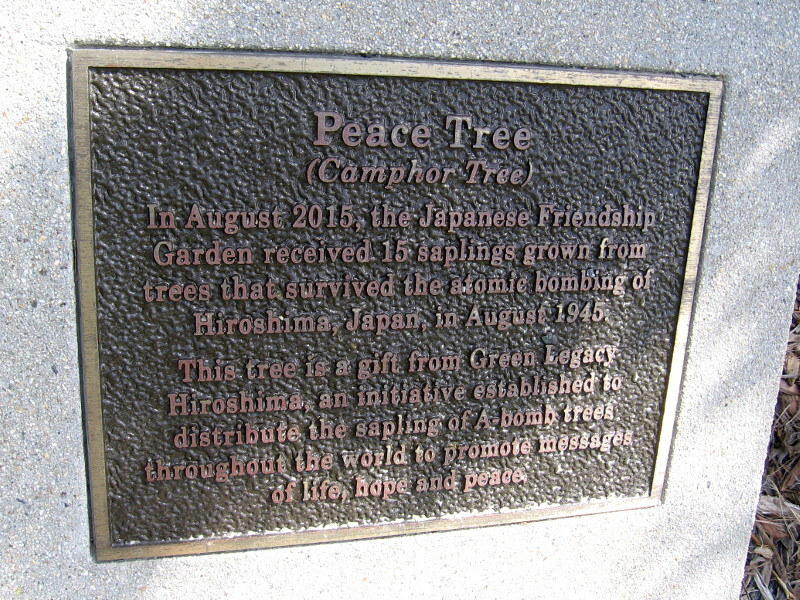 Plaque near Camphor Peace Tree in the Japanese Friendship Garden. 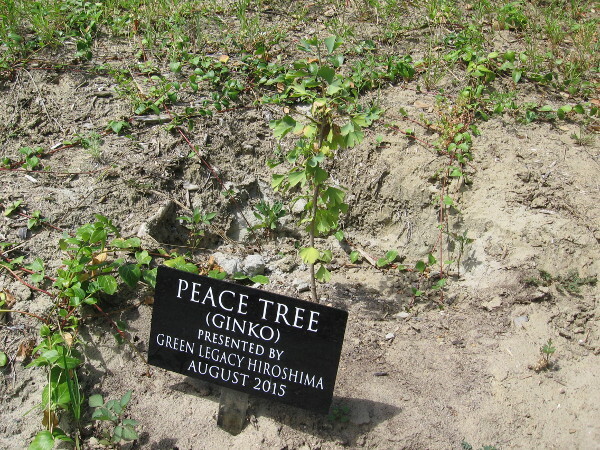 In August 15, 2015 the JFG received 15 saplings grown from trees that survived the atomic bombing of Hiroshima. 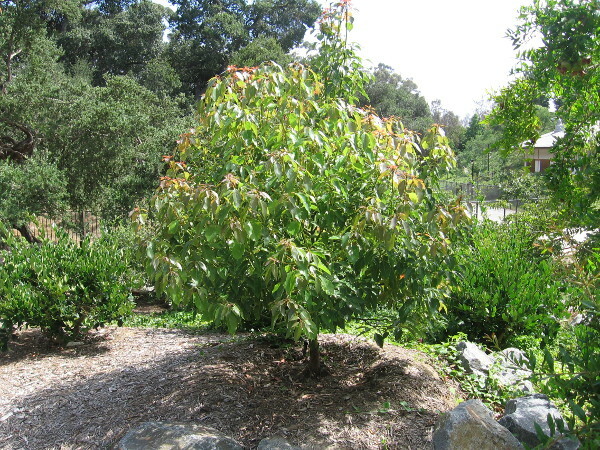 This Camphor Peace Tree flourishes in the Japanese Friendship Garden. Proof that life, hope and peace can prosper. 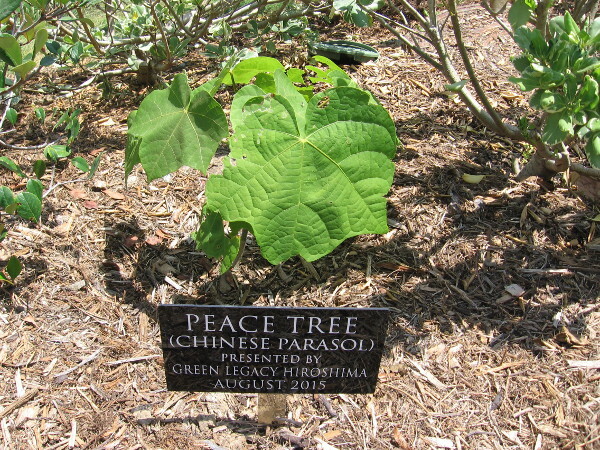 Posted on July 30, 2017 Tags balboa park, beautiful, friends, gardening, gardens, hope, japan, japanese friendship garden, life, love, peace, photography, san diego, treesLeave a comment on The Peace Trees of the Japanese Friendship Garden. 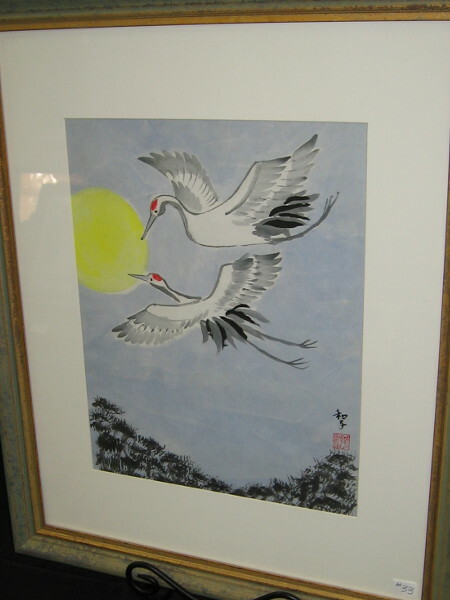 Beautiful Japanese brush art by Friends of Taka Sumi-e.
A talented gentleman demonstrates Japanese brush painting in Balboa Park. 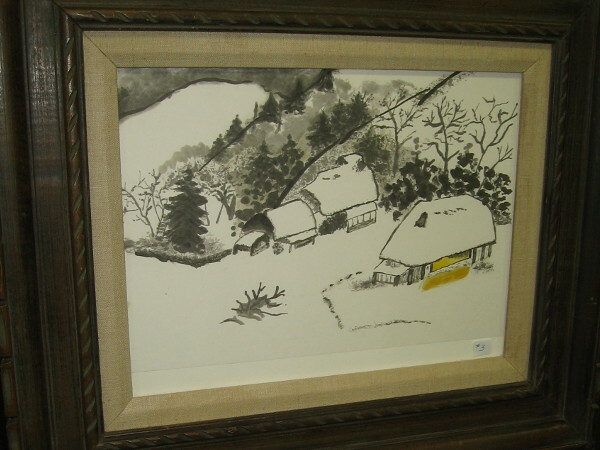 The traditional Asian art form is called sumi-e.
You might enjoy these colorful photos. 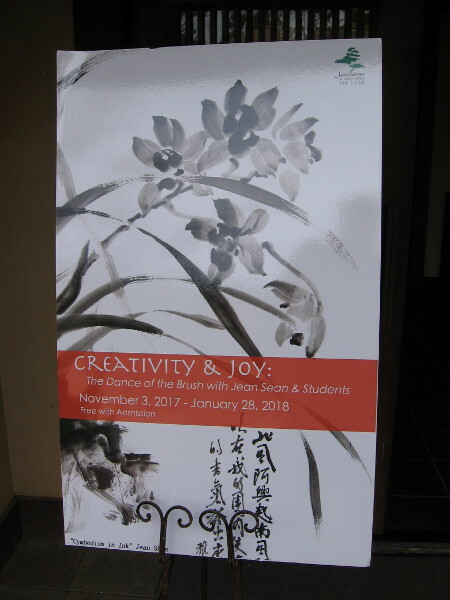 Yesterday I strolled into the Casa del Prado to view an exhibition put on by the Friends of Taka Sumi-e, a society in San Diego whose members produce beautiful works of Japanese brush art. The room was filled with abundant life. 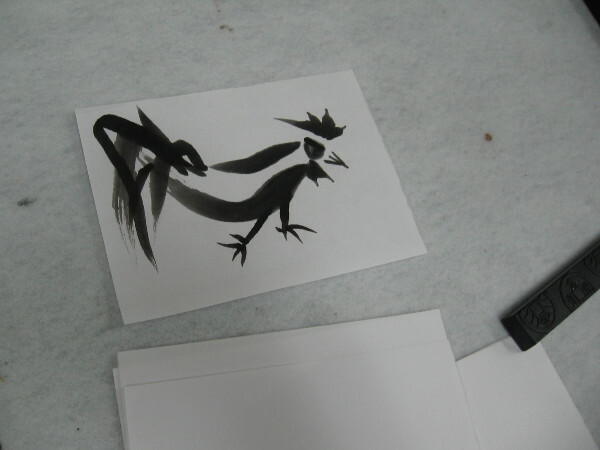 A couple of friendly people explained a little about the traditional Asian art form of sumi-e, or brush drawing. 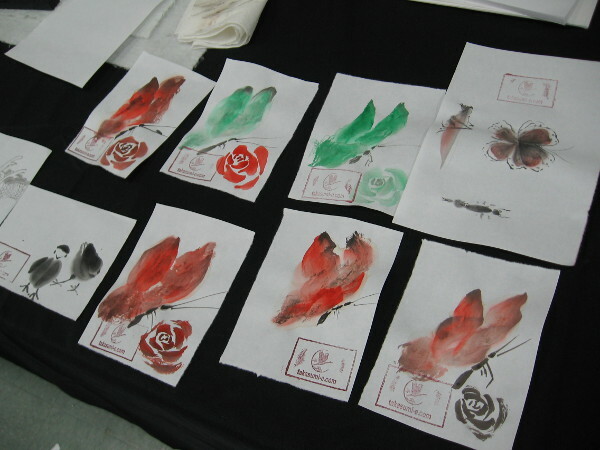 I learned that the “four treasures” are ink, stone, paper and brush. 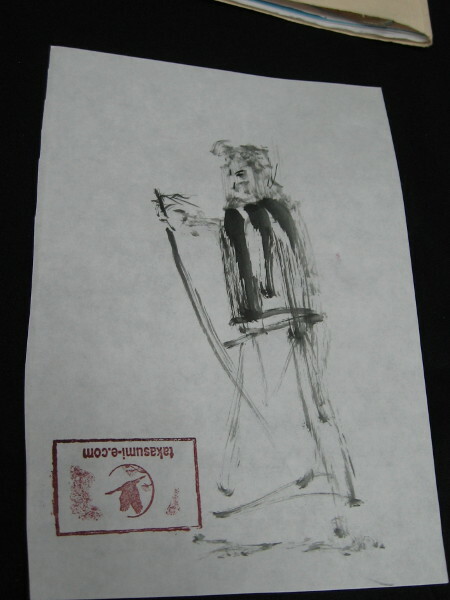 I learned a hard inkstick is rubbed in water against a rough, mortar-like inkstone to produce the ink. 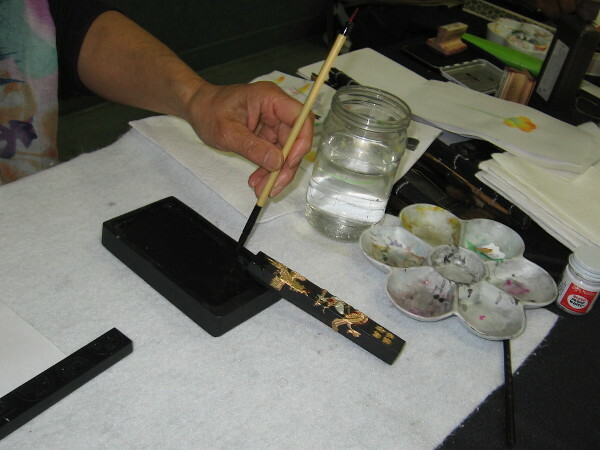 I learned that in Japan both calligraphy and painting often use ink produced this way. 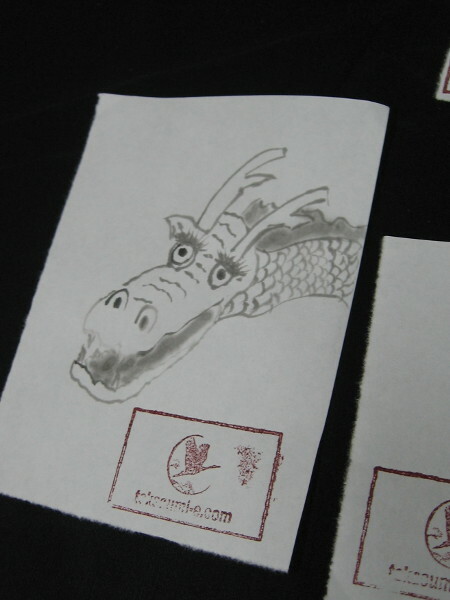 I also observed how amazing the finished works can be. Take a look! 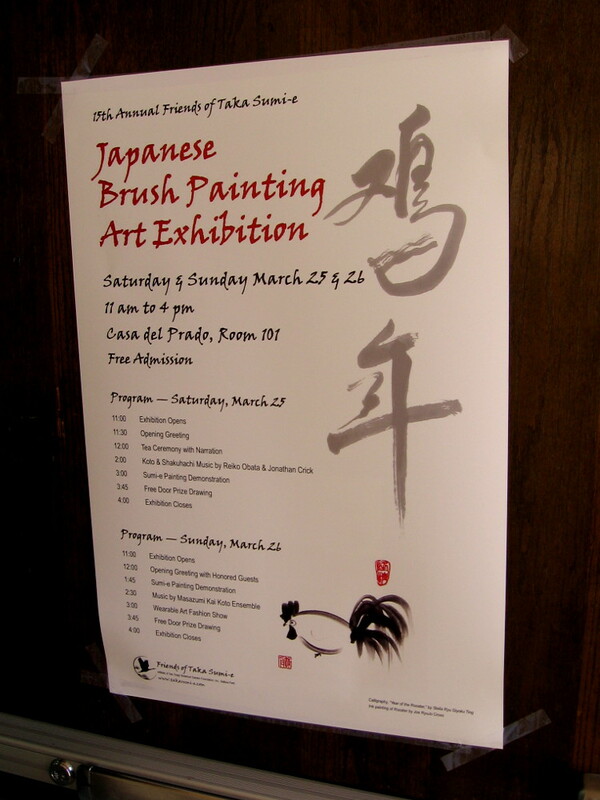 A fantastic Japanese Brush Painting Art Exhibition was held inside the Casa del Prado. 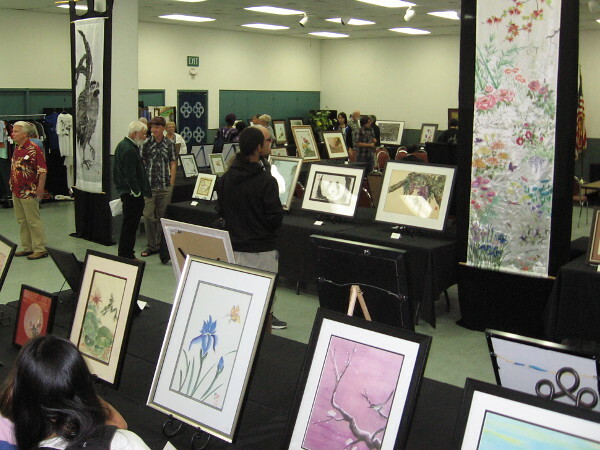 The free event was put on by the Friends of Taka Sumi-e of San Diego. 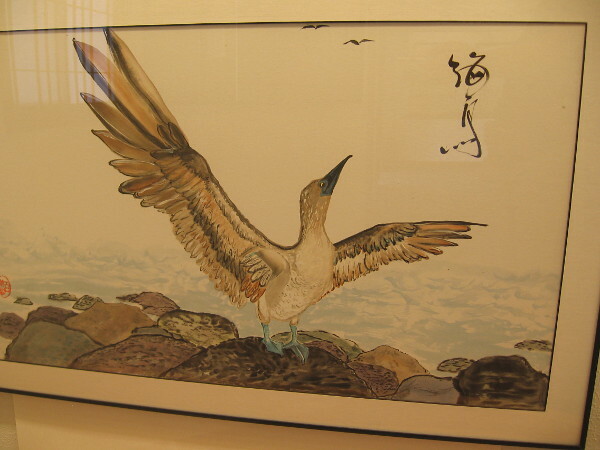 Many beautiful works of Japanese brush art could be admired by the public in the Casa del Prado. An inkstick was ground into the inkstone. 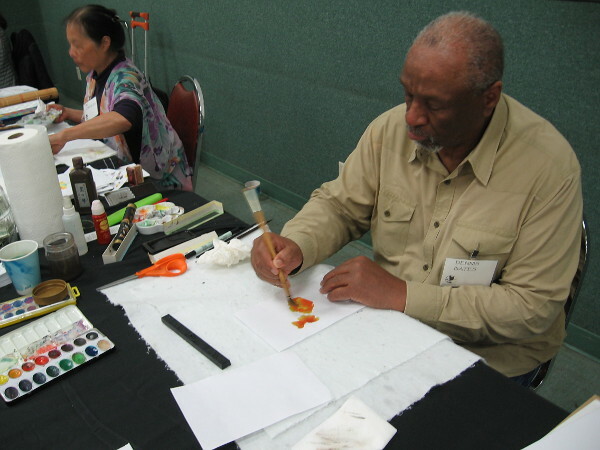 The artist prepares her brush for another drawing. It’s the year of the Rooster. 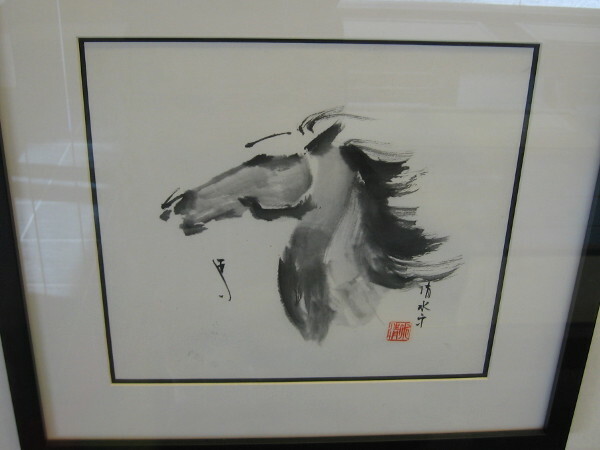 A few careful strokes of the brush expresses eternity. Colorful butterflies have gathered atop this table. 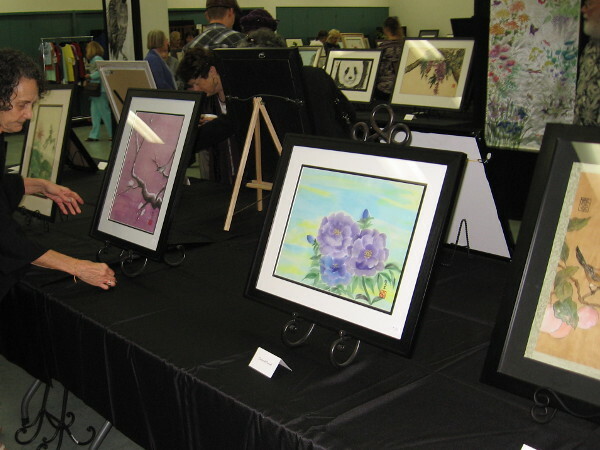 Amazing finished artwork filled many tables. By artist Ileane Tatar. 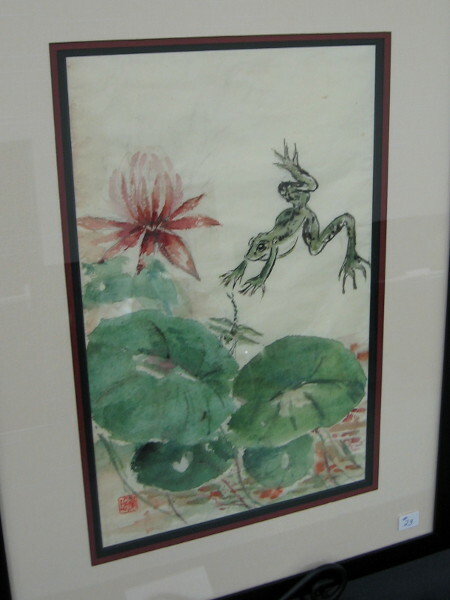 A jumping green frog. By Ileane Tatar. 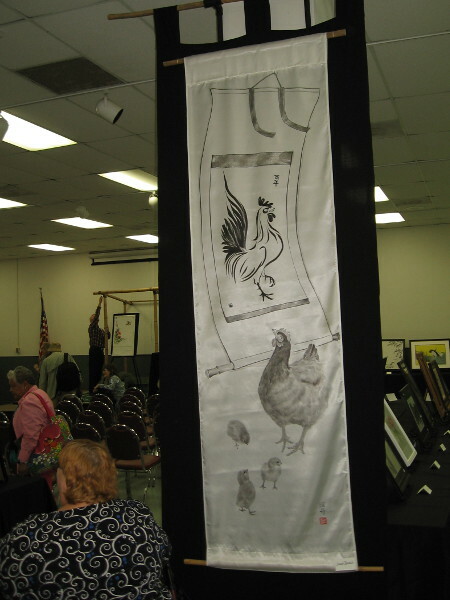 A hen with chicks looks up at a rooster banner–a banner portrayed on a banner! Art by Louise Rendich. 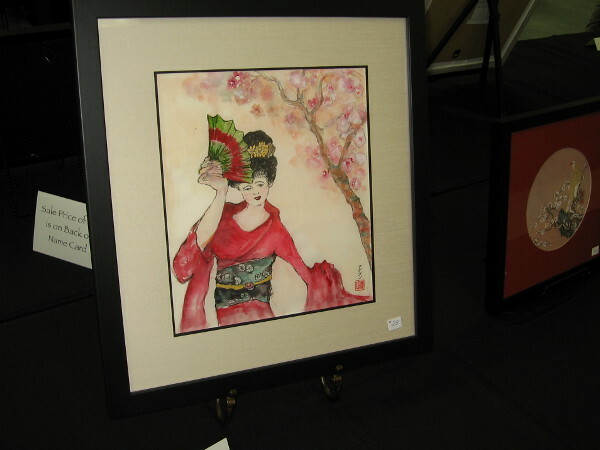 Two koi and cherry blossoms, by Pat Wolfe. I believe these might be storks. By artist Kazuko (Kay) Mese. A rugged mountain landscape with ancient trees. By artist Debra Hirschy. 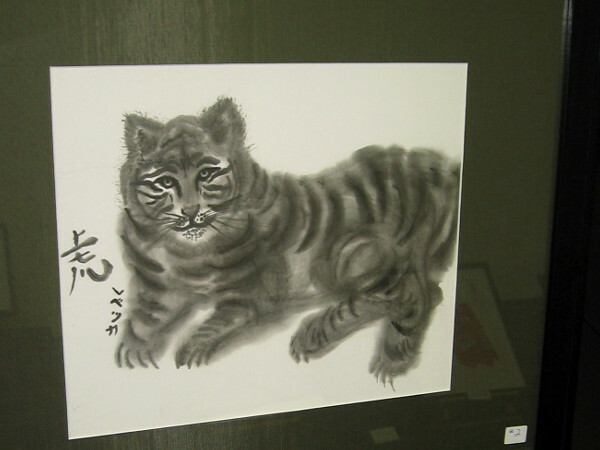 A humorous cat, by artist Karen Straus. 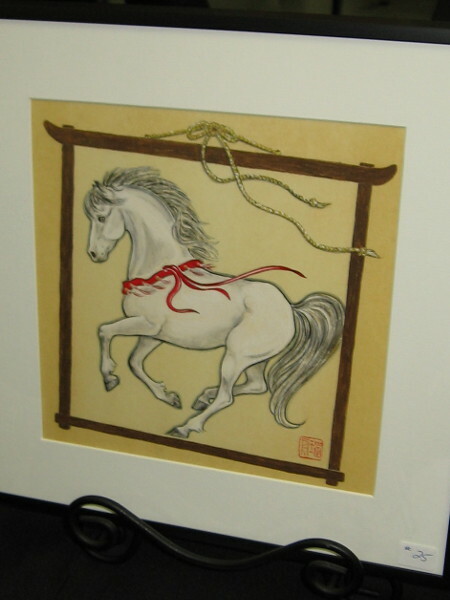 A trotting horse, by Louise Rendich. One could spend hours in this room. 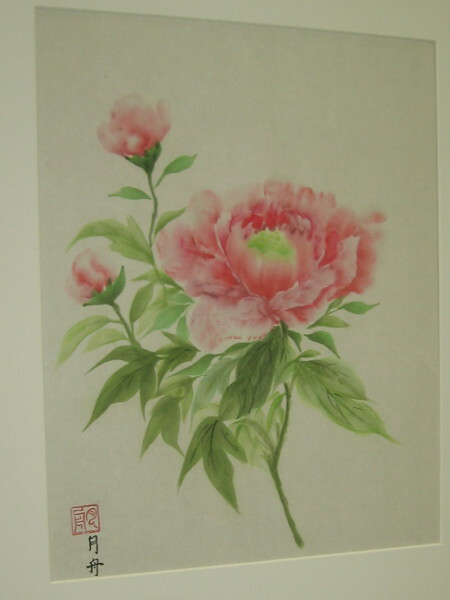 Superb flowers, very fine art by Takashi Ijichi. 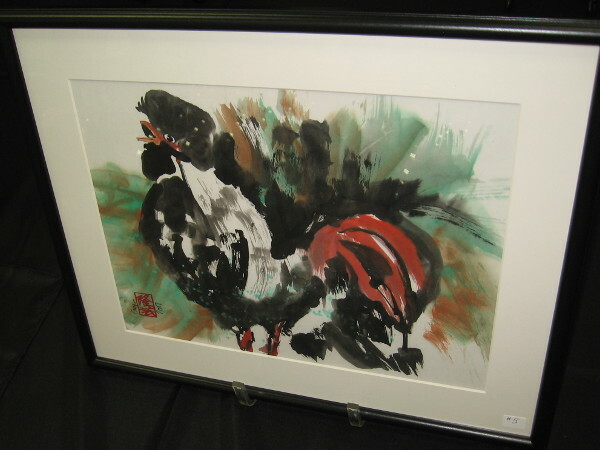 Another unique rooster with generous daubs of color. 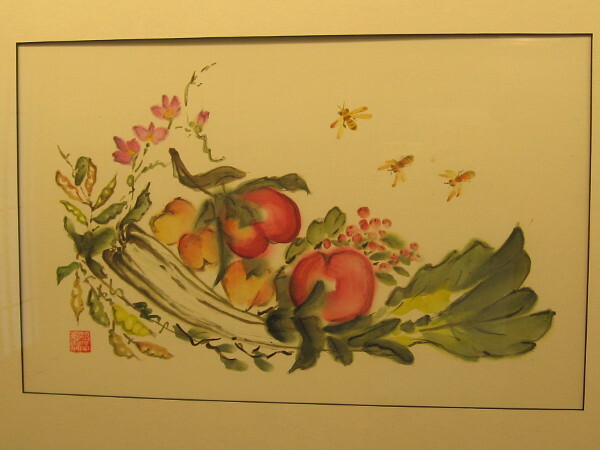 Delicate flowers and leaves, by artist Soon Chu. 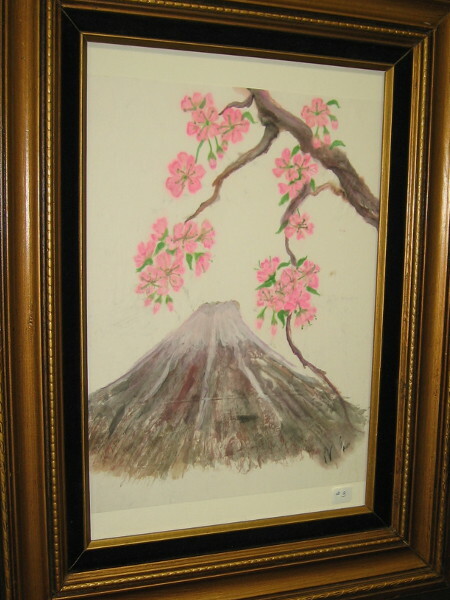 Pink blossoms above a volcano, by Marlene Leet. I would love to live here. 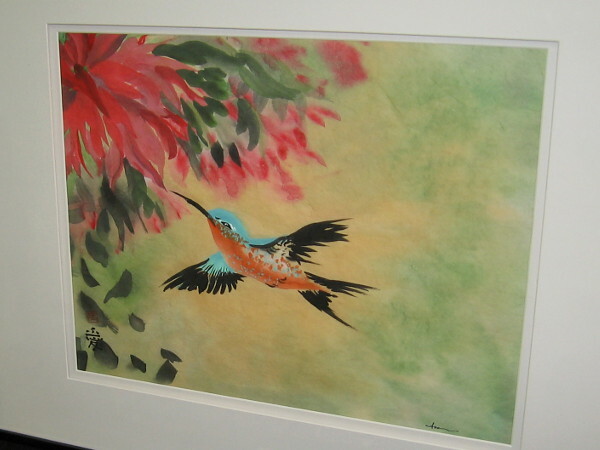 Dreamy Japanese brush art by Marlene Leet. A furry feline. Rebecca Leet-Homung. So much beauty to absorb. One’s life is uplifted. 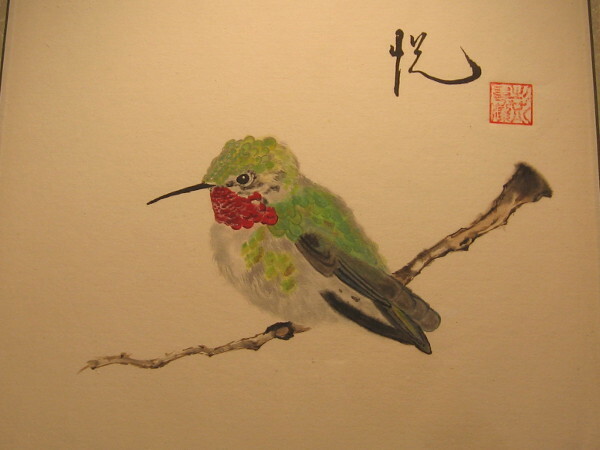 A hummingbird, by artist Iris Lowe-Reiss. 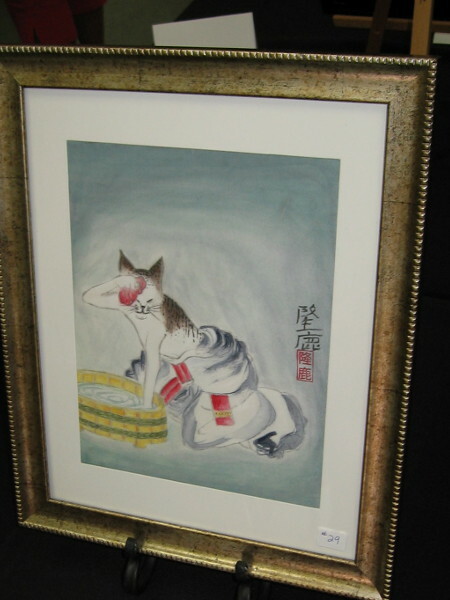 Read my short story The Child and the Koi by clicking here! 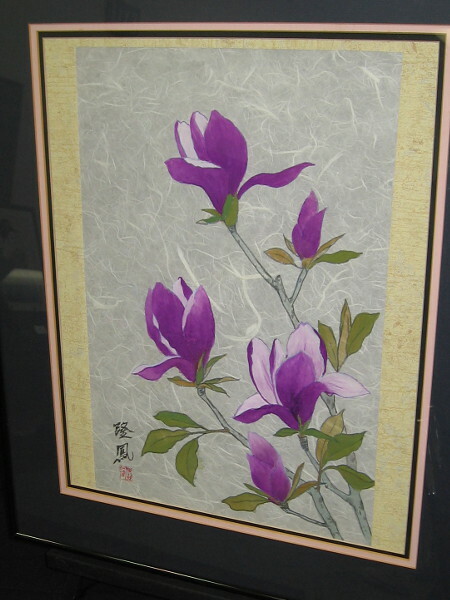 Posted on March 27, 2017 Tags amazing, art, artists, balboa park, beautiful, casa del prado, color, creativity, culture, events, japan, painting, photography, san diego4 Comments on Beautiful Japanese brush art by Friends of Taka Sumi-e.
Beautiful cherry blossoms at Japanese Friendship Garden. 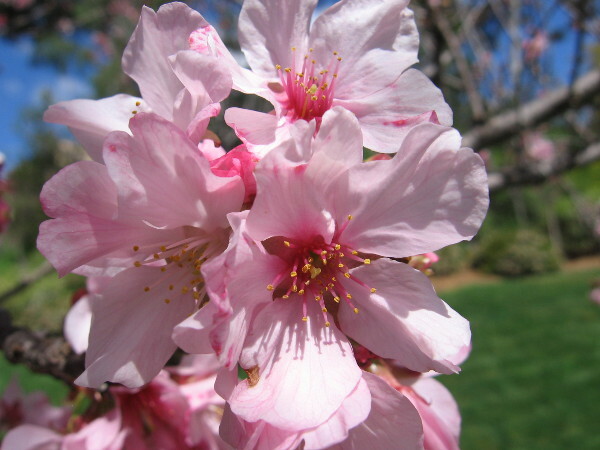 The cherry blossoms are opening in bunches at the Japanese Friendship Garden in early March. 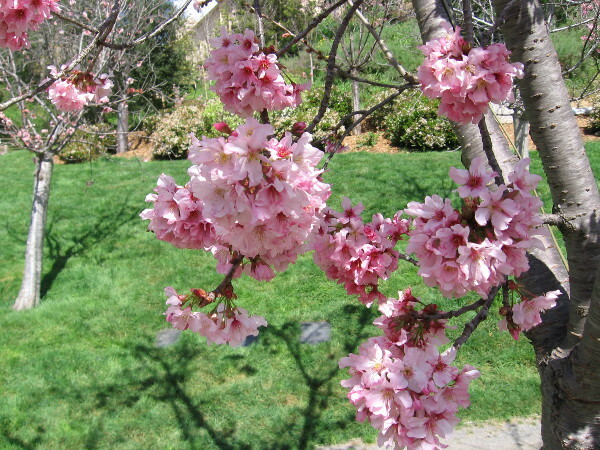 The Japanese cherry trees in Balboa Park are beginning to really blossom! This morning I walked through the canyon at the Japanese Friendship Garden and took in the indescribable, almost heavenly beauty. 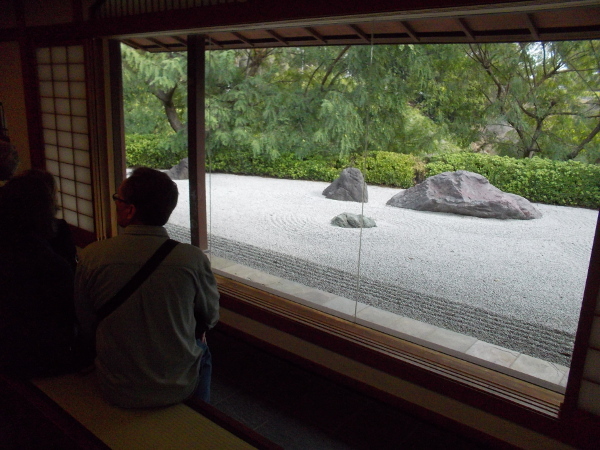 Then I sat down near the Inamori Pavilion, in the perfect mood to reflect and write. Beauty springs forth like a miracle. 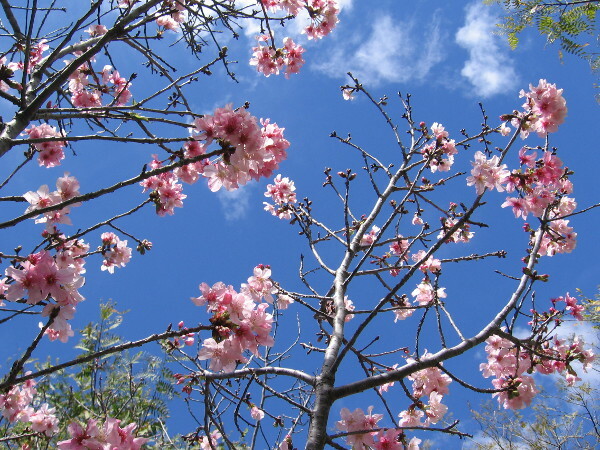 Pink blooms in blue San Diego sky. 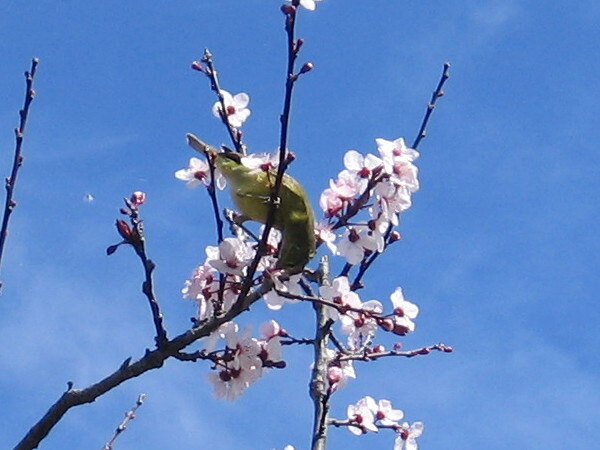 A small bird high on one branch enjoys the newly opened cherry blossoms. 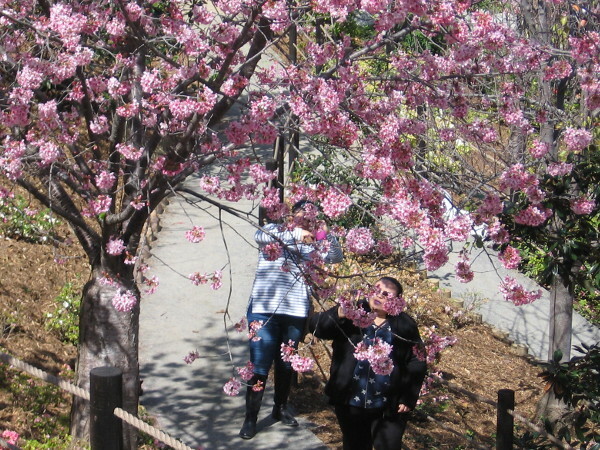 People look up in wonder at a magical Japanese cherry tree. 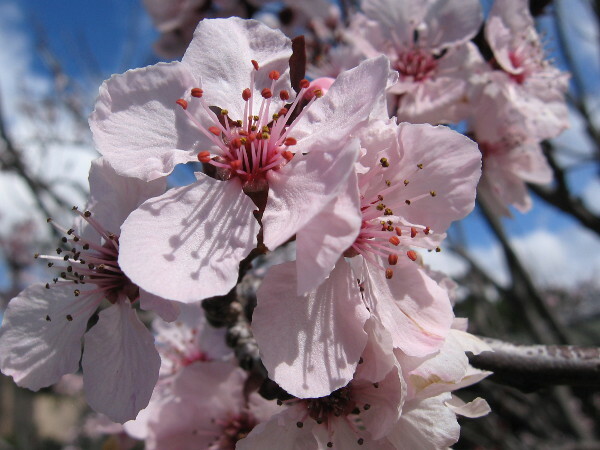 The grove of Japanese cherry trees in the canyon is starting to put on a great show. 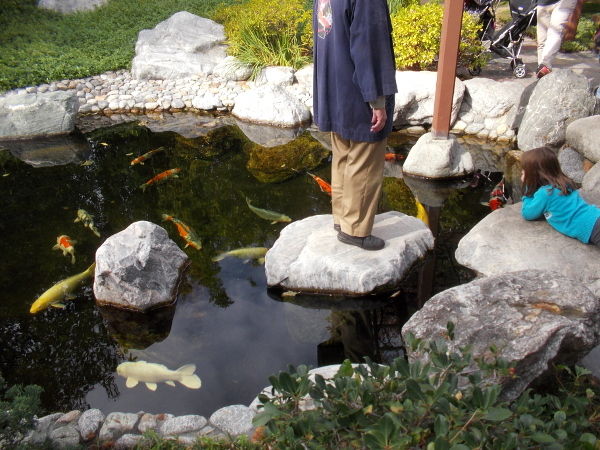 A philosophical short story titled The Child and the Koi. 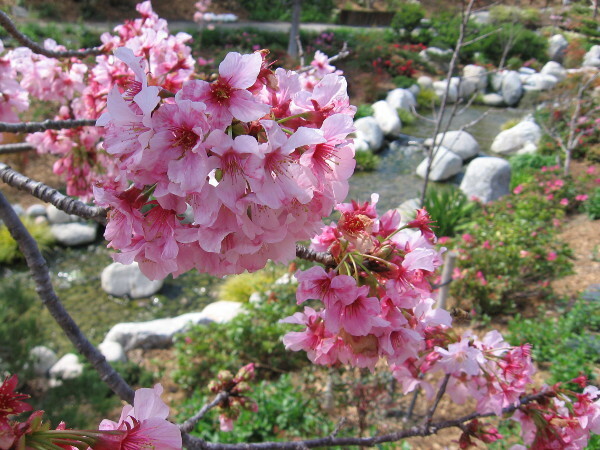 Posted on March 5, 2017 Tags amazing, balboa park, beautiful, cherry blossoms, flowers, japan, japanese friendship garden, life, nature, photography, san diego, spring, trees, wonderLeave a comment on Beautiful cherry blossoms at Japanese Friendship Garden. 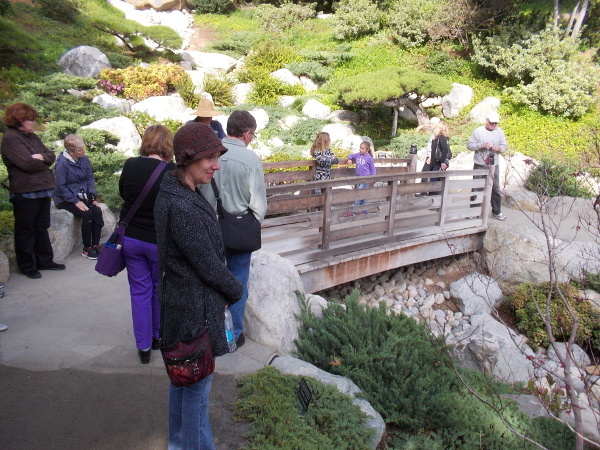 Photo tour of Japanese Friendship Garden canyon. 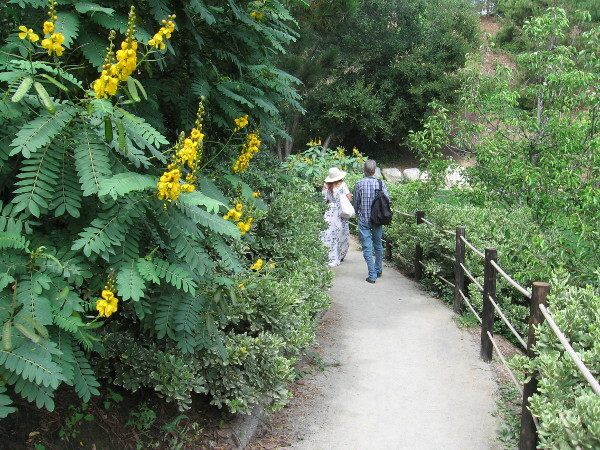 Visitors to the Japanese Friendship Garden in beautiful Balboa Park carefully step across a stream that flows through a lush canyon. 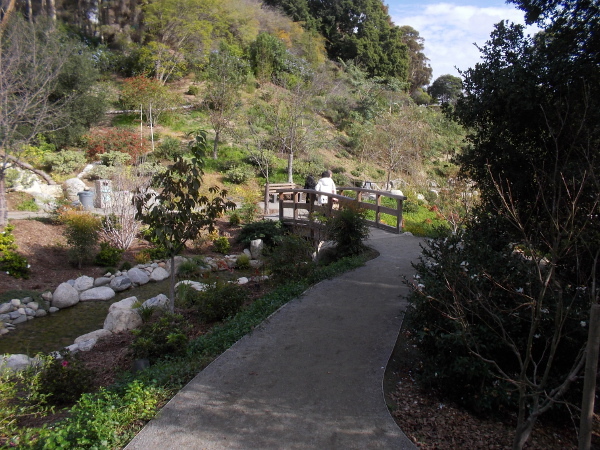 A few days ago I took you on a short photo tour of the upper level of the Japanese Friendship Garden in Balboa Park. You can find that here. 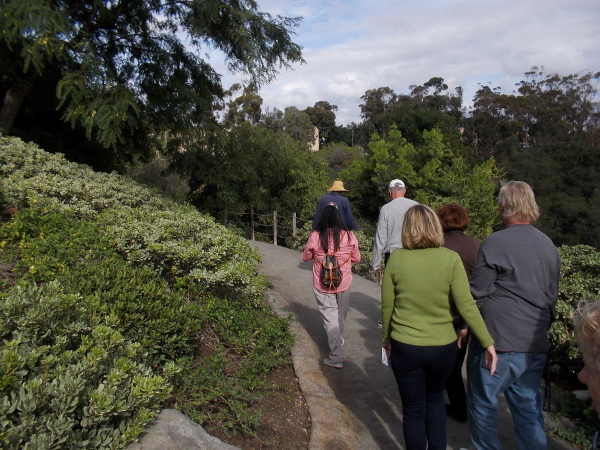 Now we follow our docent tour guide down a gently sloping path into the large canyon expansion below. Of course, a few quick photos don’t really convey the profound beauty and tranquility of this place. And my understanding of the garden is quite limited. 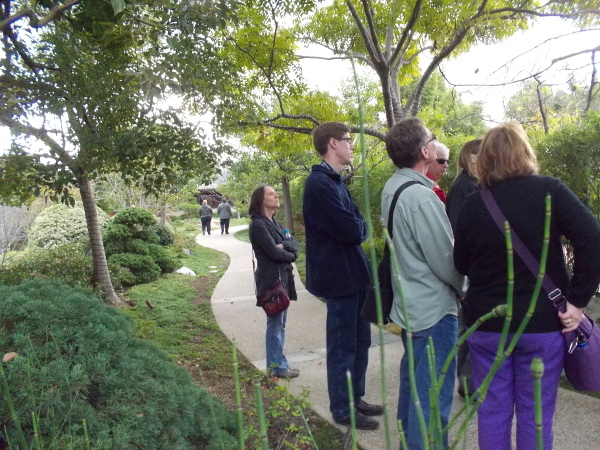 While our tour guide spoke of the garden’s careful creation, its tending, and the meaning of its elements, I was so absorbed in the surrounding beauty that I took only a few notes. Please read the photo captions, and forgive me for not knowing more. I’m still learning. 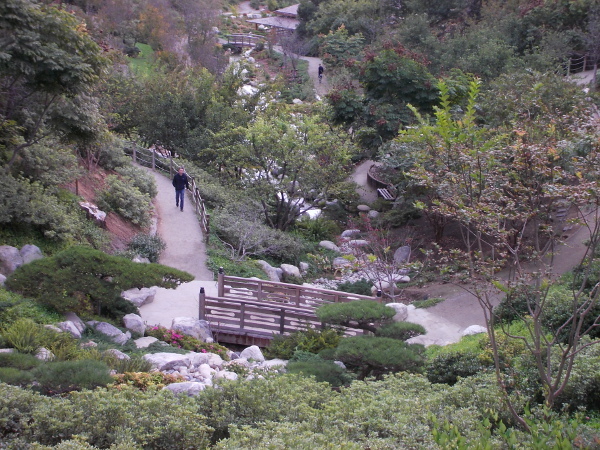 Gazing down from an overlook into the canyon expansion of the Japanese Friendship Garden in San Diego. 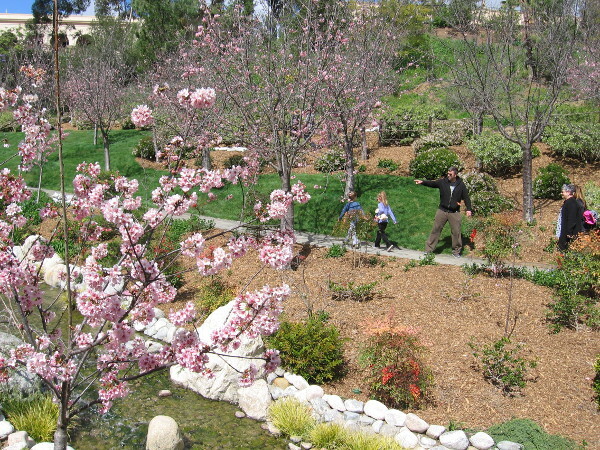 This large section of the garden opened in 2015. 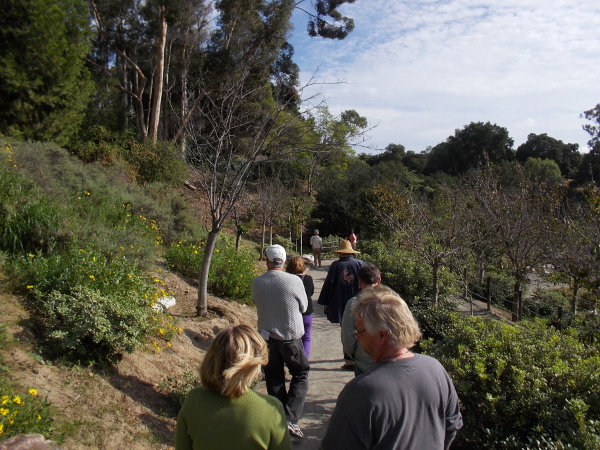 Before heading into the canyon, our docent tour guide talks a little about what we will see below. 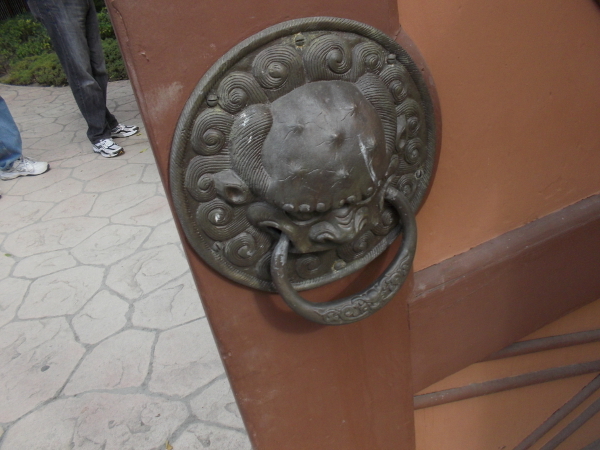 Beautiful handle on the Charles C. Dail Memorial Gate which leads into the canyon. 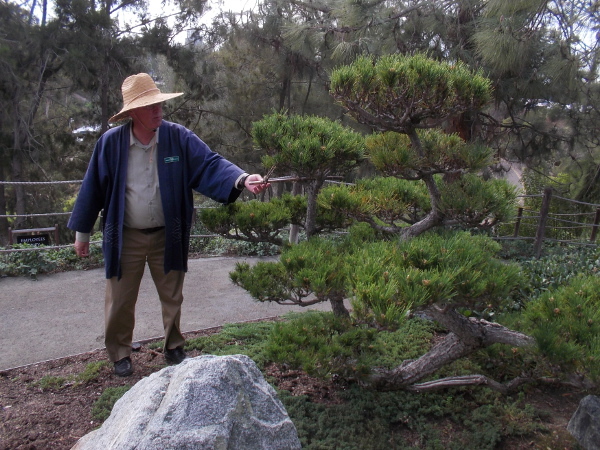 After stepping through the gate, the docent shows us a black pine. This one is being trained with a bamboo splint to assume an aesthetically beautiful shape. 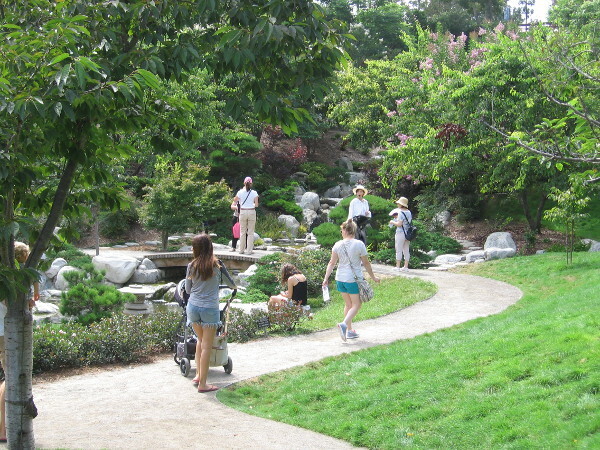 Visitors to the Japanese Friendship Garden head down a path that leads from the Upper Garden into the Lower Garden. The winding path is a journey of discovery. Here we are, just walking along, feeling at peace, surrounded by so much natural beauty. 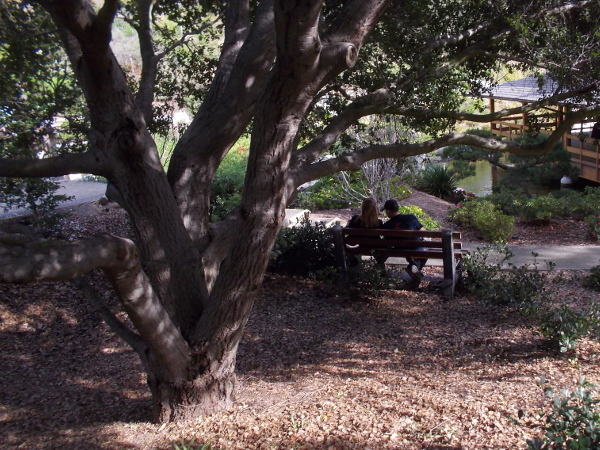 Trees provide shade and fluttering leaves; a bench near a stone lantern allows for rest and meditation. We have arrived at the Dragon Bridge, where a serpentine dry waterfall creates the impression of flowing water. The carefully-placed white stones in the dry waterfall were imported. But the yellowish boulders on top were found in the canyon. 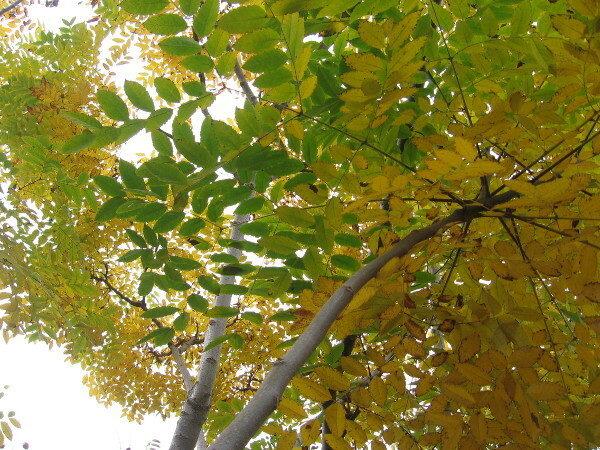 A Japanese garden must contain an element of what is native. 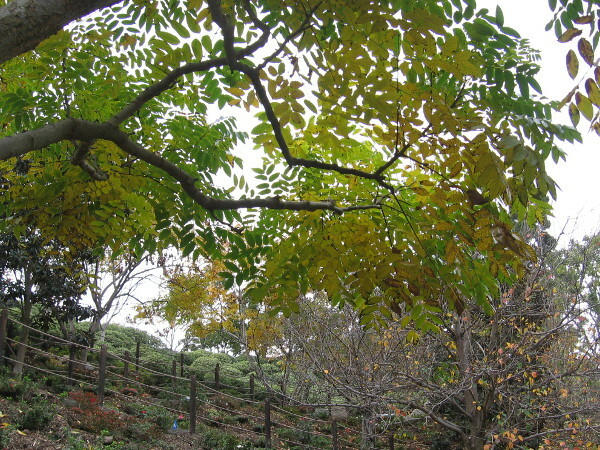 One of three highly-prized cloud-like trees placed near the dry waterfall. 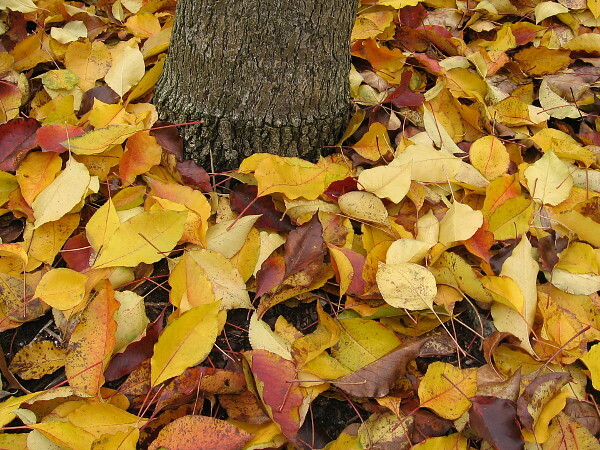 Every part of the garden has been designed with the greatest attention to detail. 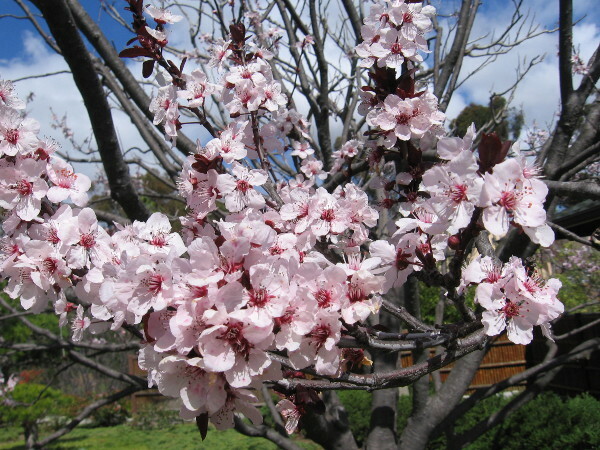 Now we walk into an area full of cherry trees. 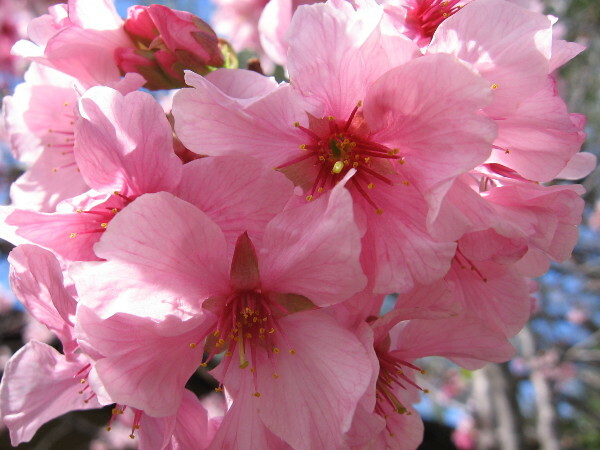 In spring, if the preceding winter had a sufficiently cold period, the grove of 160 trees becomes magical with cherry blossoms. 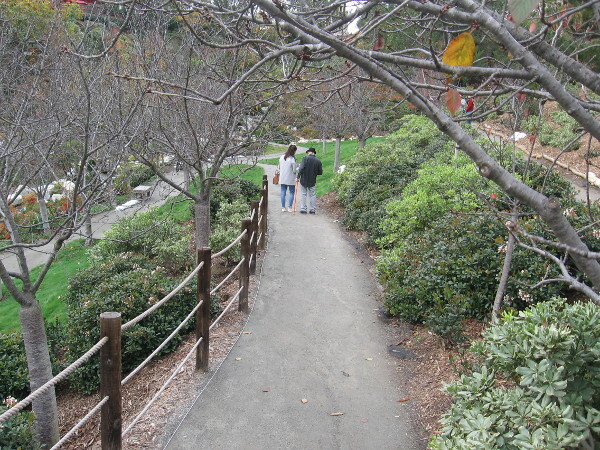 Walking slowly along a winding path through the cherry tree grove. It’s a November day in San Diego. 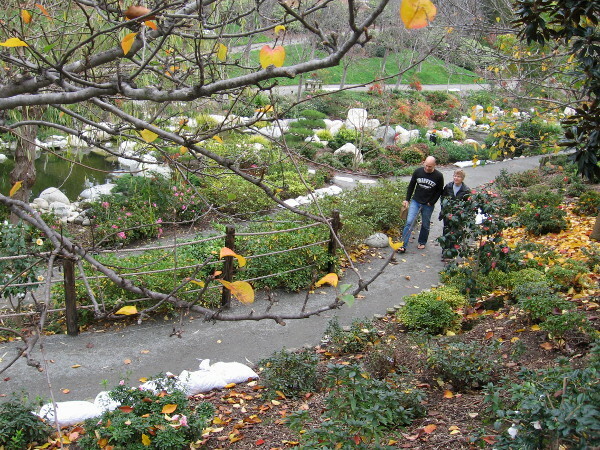 But the Japanese Friendship Garden is beautiful in every season. 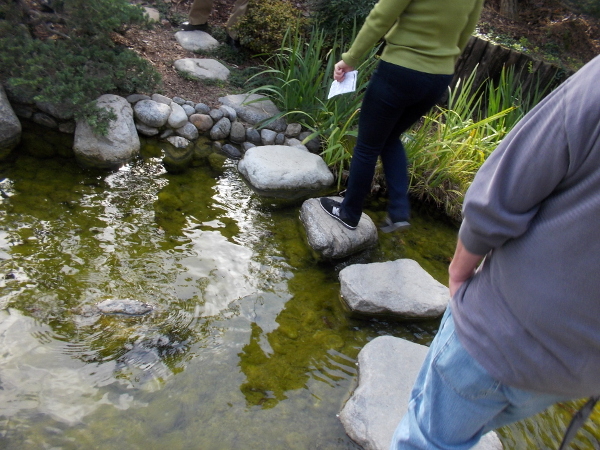 Approaching a second bridge where there is a pond and a turtle-shaped small rock island. 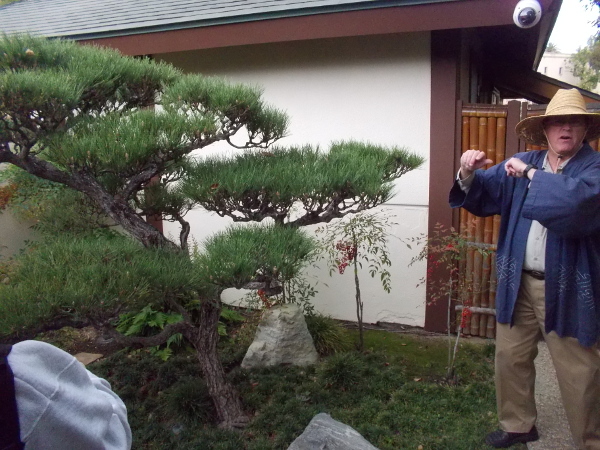 Our tour guide shows us a bamboo deer chaser, or shishi odoshi. You might recall that we saw another in the garden’s upper level. Crossing the low bridge as bright water ripples gently past. The rock with a bent shape at the bottom of the small waterfall represents a salmon, which like we human beings fights to move upstream, against difficult currents. We walk along the artificial stream. 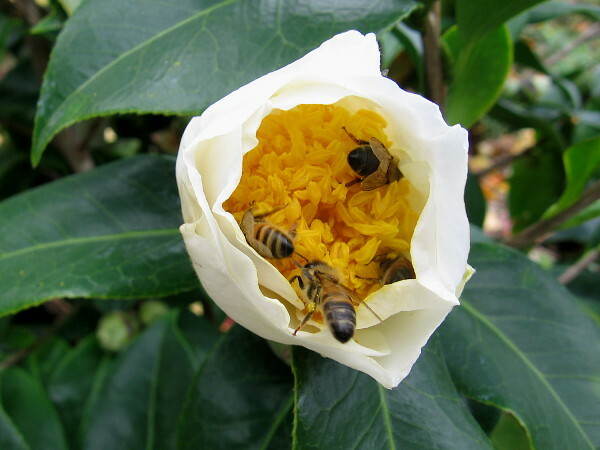 Various flowers can be seen here at different times of the year, including azaleas and camellias. 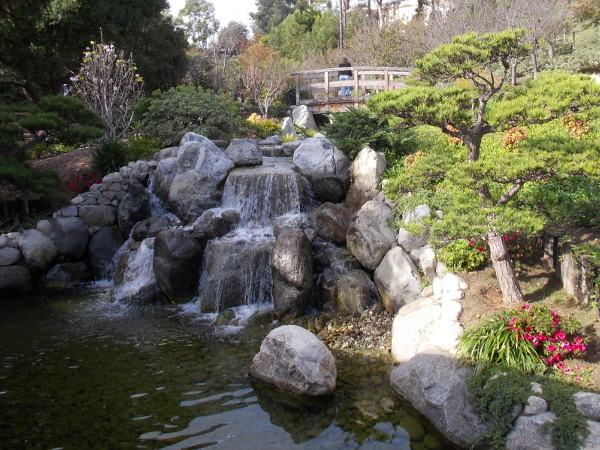 A tranquil scene at the Japanese Friendship Garden. There are five bridges, each with its own distinct character. Sitting on a shady bench. 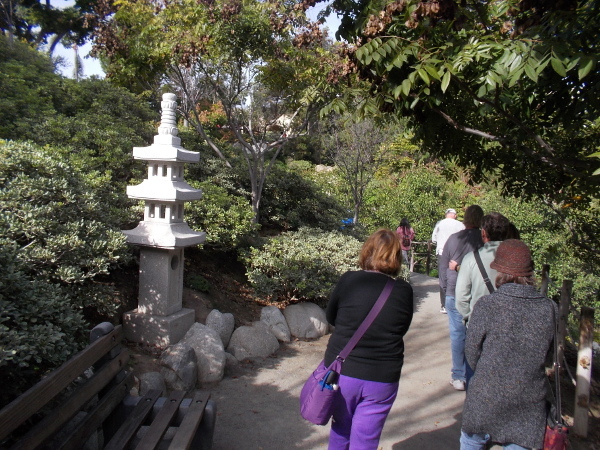 Now we are walking past an ornate Nara period Japanese stone lantern. 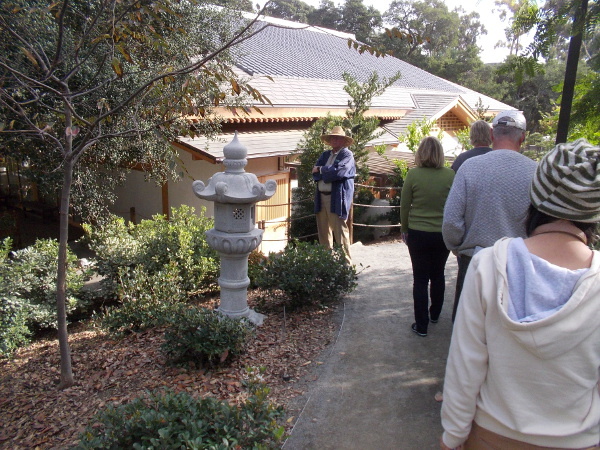 We come to the elegant Inamori Pavilion, which is used for special exhibits and events. The Sukiya-style building has a moat full of koi. The viewing deck, or engawa, looks out at a waterfall. Gazing out at the sparkling waterfall and a bridge just beyond it. 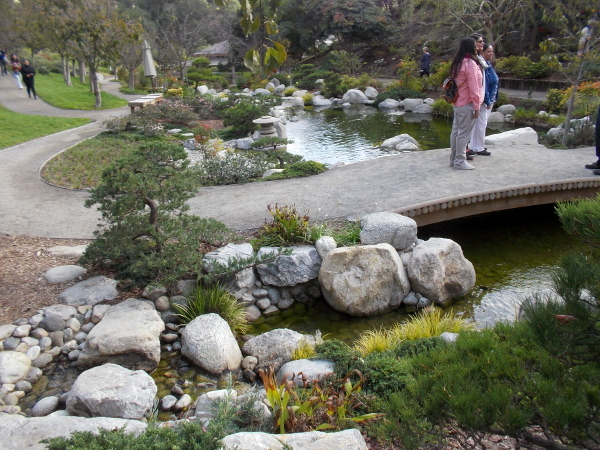 The Japanese Friendship Garden is treasured by many for its beauty, meaningful design, and serenity. 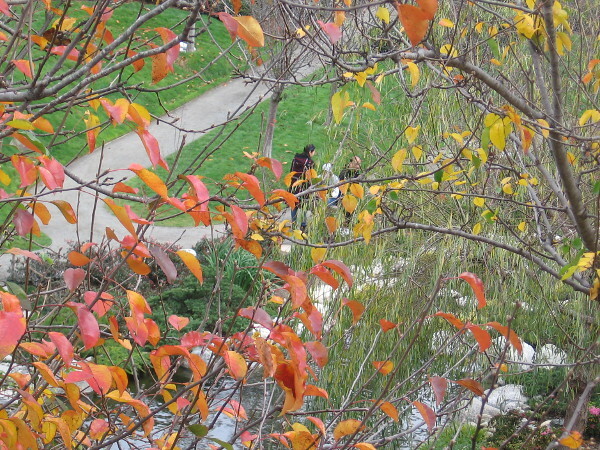 Photo of the beautiful Inamori Pavilion from nearby bridge. Posted on December 9, 2016 Tags architecture, balboa park, beautiful, gardening, gardens, japan, japanese friendship garden, nature, photography, plants, san diego, travel, trees, walkingLeave a comment on Photo tour of Japanese Friendship Garden canyon. 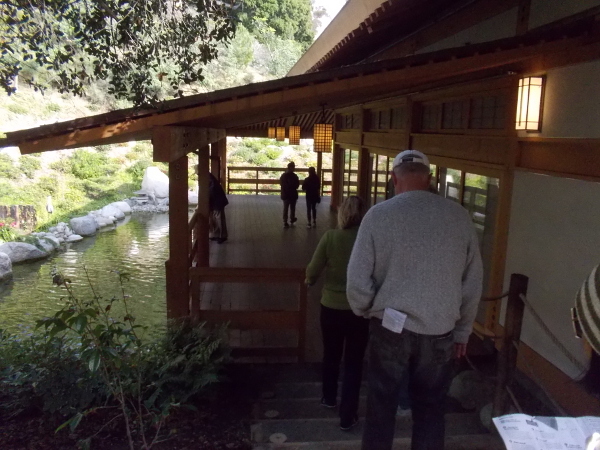 Photo tour of Japanese Friendship Garden upper level. 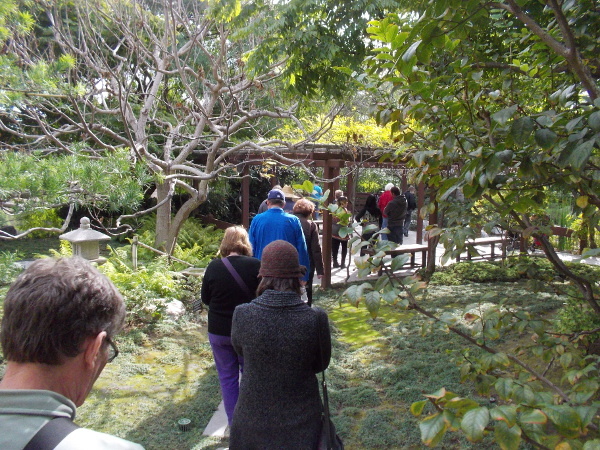 People on a tour of the Japanese Friendship Garden in Balboa Park experience the beauty and tranquility of this unique place. 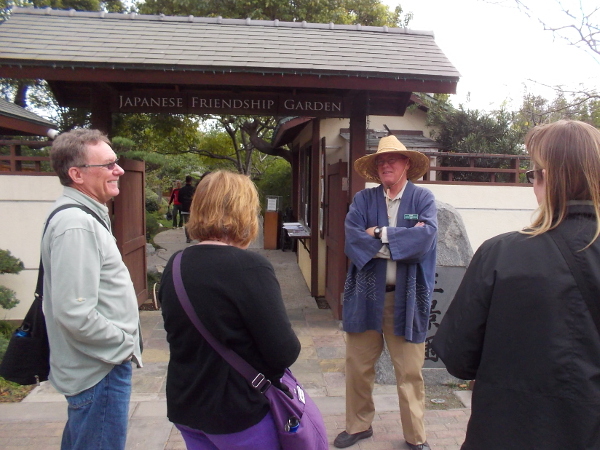 I recently went on a docent-led tour of the Japanese Friendship Garden in Balboa Park. I took photos and jotted down a few quick notes about the many things I learned. 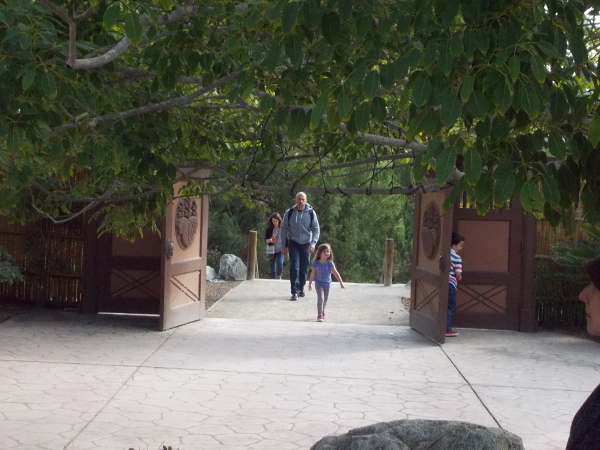 We first strolled through the upper level, then ventured down into the more recently opened canyon expansion. 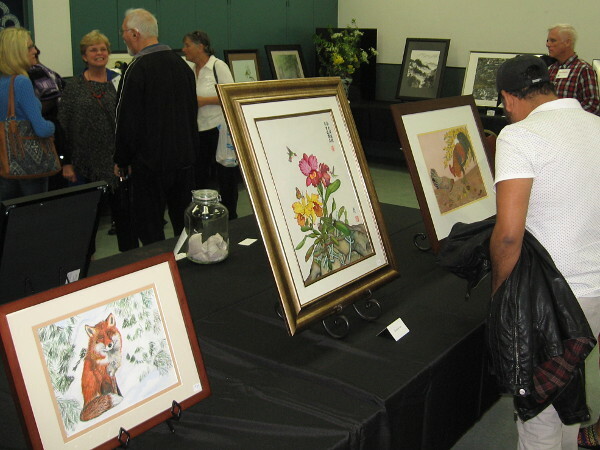 In this blog post I’ll relate a little about what our group saw in the upper level. I’ll provide a very small taste of the beauty, history and meaning of the wonderful sights in this gem of a garden. 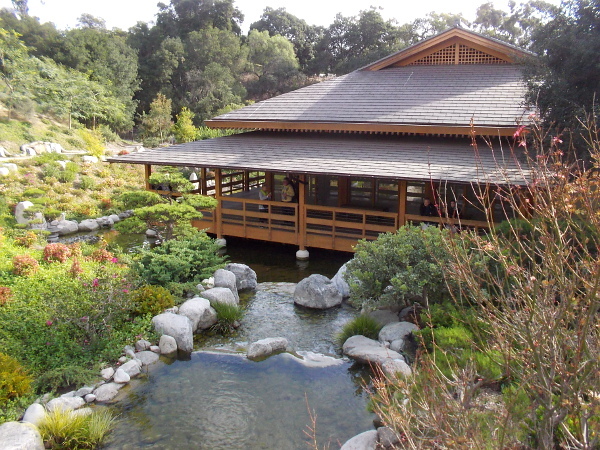 But, of course, to truly absorb the quiet beauty, you must visit the Japanese Friendship Garden yourself. Even better, become a member! 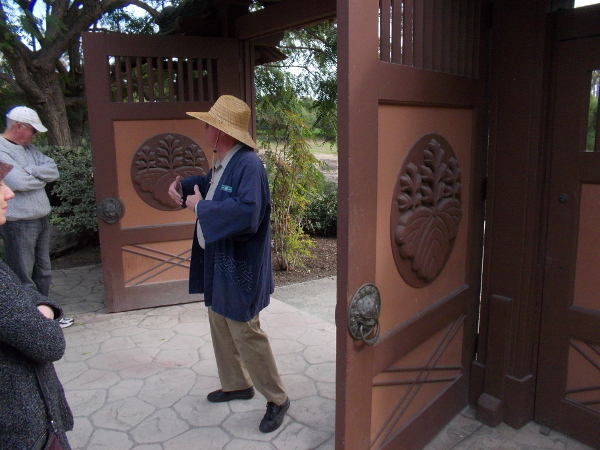 Our friendly docent guide meets everyone in front of the Japanese Friendship Garden, near the Tea Pavilion. 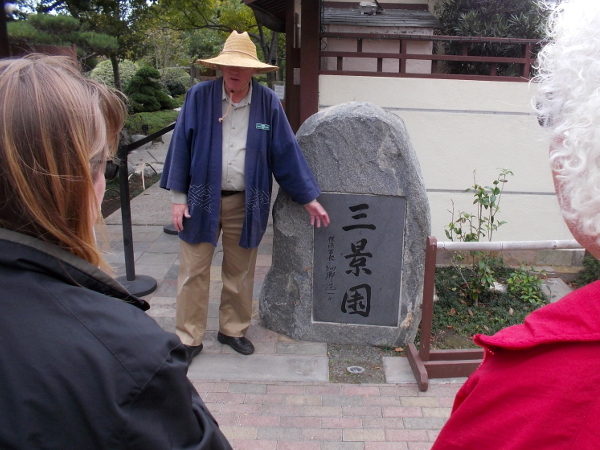 The docent explains the kanji on a rock near the entrance. It roughly translates Three Scene Garden. 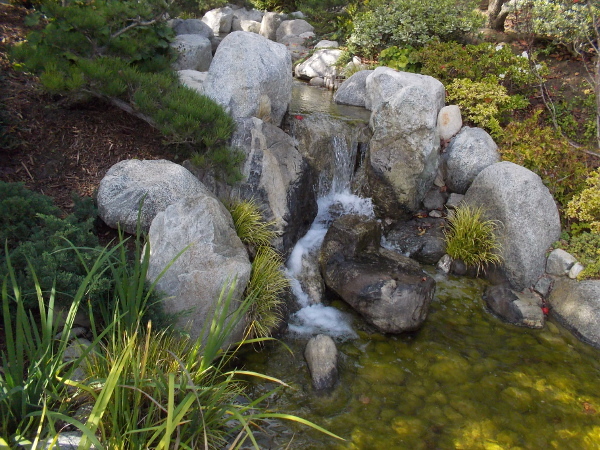 The three elements represented in every Japanese garden are mountains, water and the pastoral. 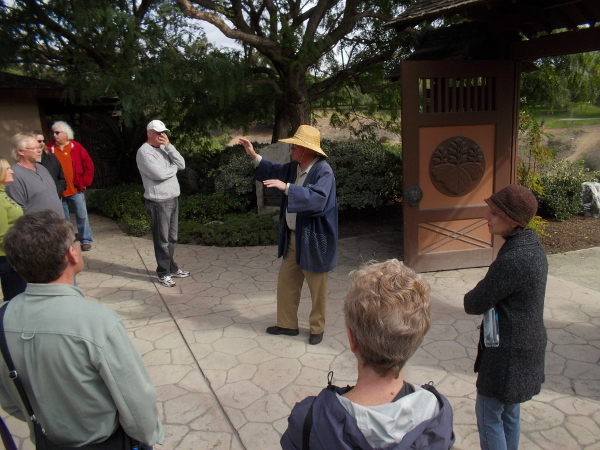 Before entering the garden, the docent explained some differences between traditional European and Japanese gardens. Formal European gardens originated as demonstrations of a person’s wealth–think of the wide, lavish gardens beside the palaces and chateaus of Europe. They show man’s ability to master and order nature, with symmetrically arranged rows of flowers and grandiose columns and gravity-defying fountains. 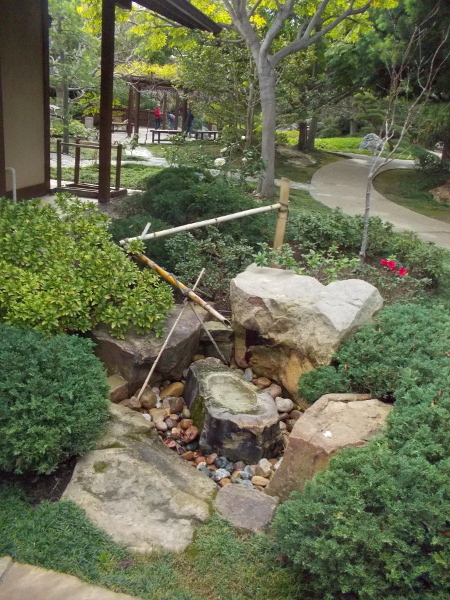 Traditional Japanese gardens, however, are quite different. 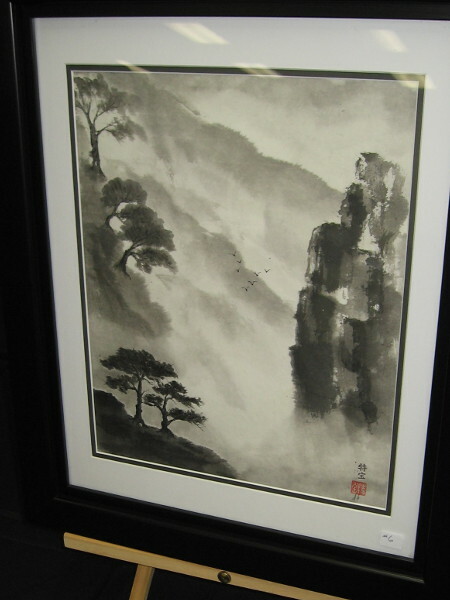 Inviting meditation and abstraction, they emphasize what is natural. 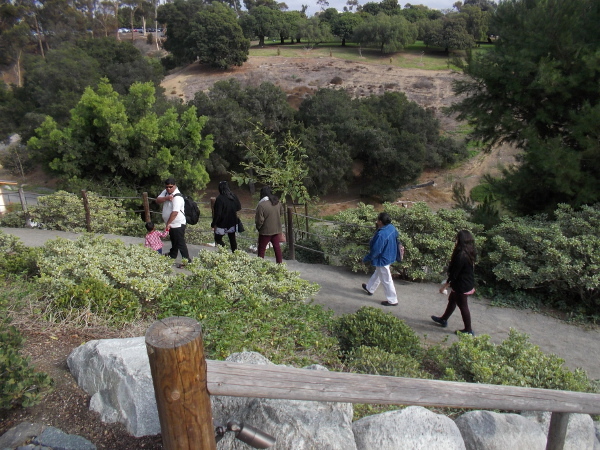 They simulate a winding, personal walk through an idealized, beautiful wilderness. Rugged stones, dripping water, asymmetrical trees bent by the elements–one encounters scenes found in nature that might represent a growing human life and the experiences that shape who we become. 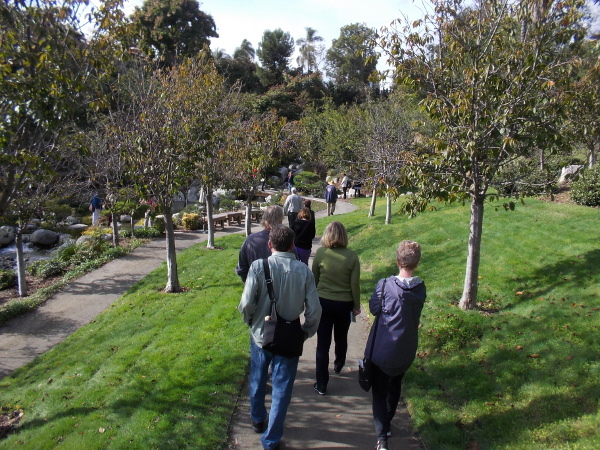 Walking slowly along the pathway through the upper level of the Japanese Friendship Garden. Scenes open as corners are turned; every visit is a personal journey of discovery. 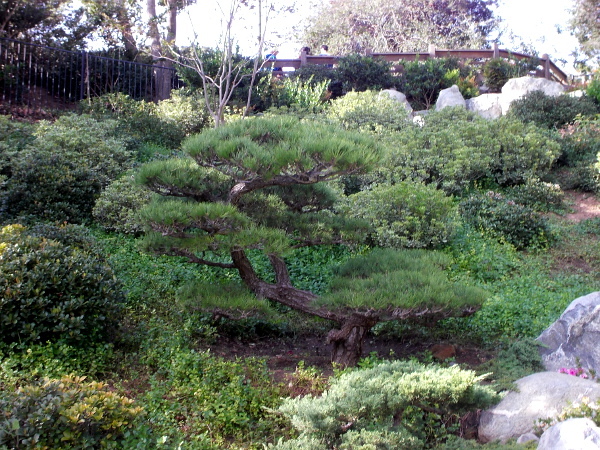 A black pine has been carefully pruned over many years to provide a sense of uplift to the passing viewer at eye level. The needles all point upward. A shishi-odoshi made of hollow bamboo. 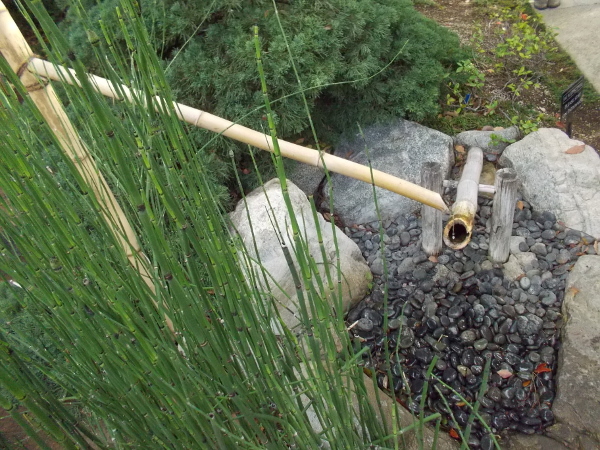 When one end fills with water, the swiveling bamboo tips forward then falls back, producing a sharp clack. The sudden motion and noise scares deer and other herbivores from the garden. 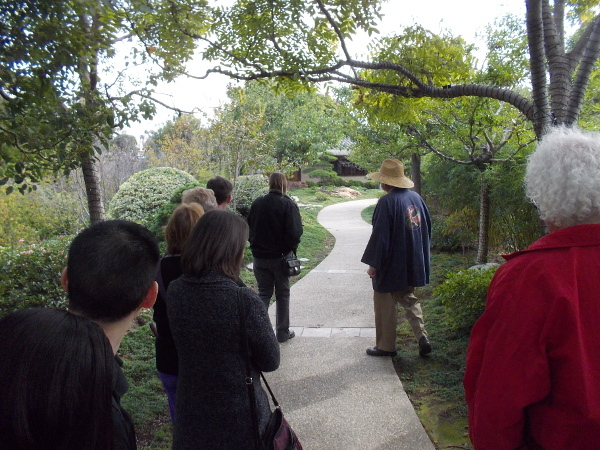 We continue down the winding path through the upper level of the Japanese Friendship Garden. 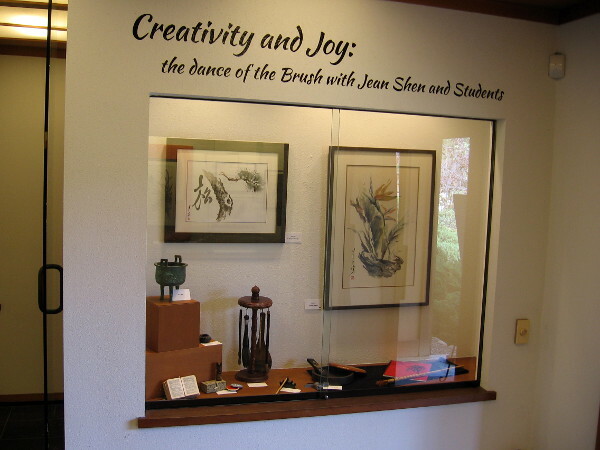 This is a zen garden, with a focus on spiritual meditation and human appreciation of beauty. 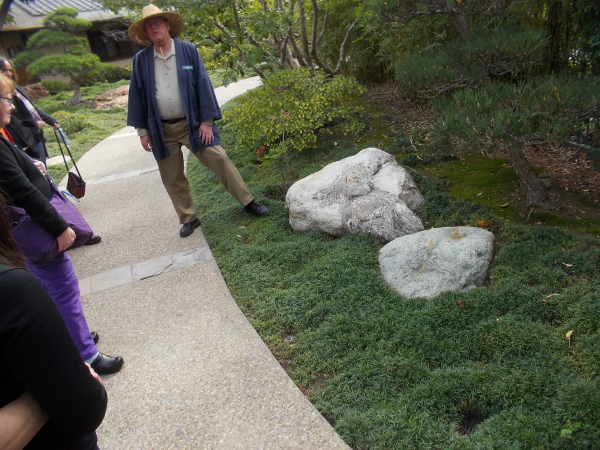 Rocks are a very important part of every Japanese garden. Representing rugged mountains, they are chosen with extreme care and the best ones are highly prized. 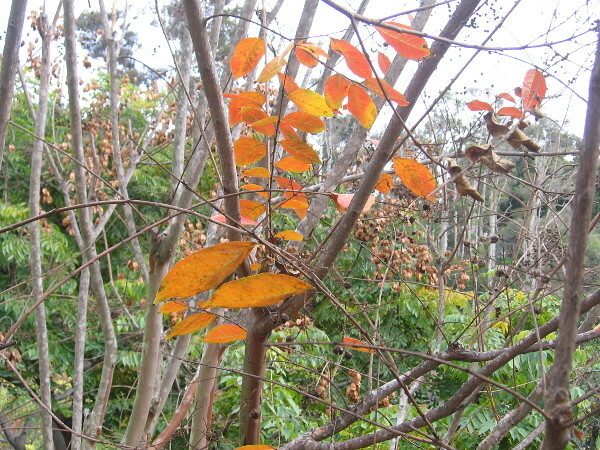 These plants have been pruned using the Japanese technique called o-karikomi to look like rounded boulders. 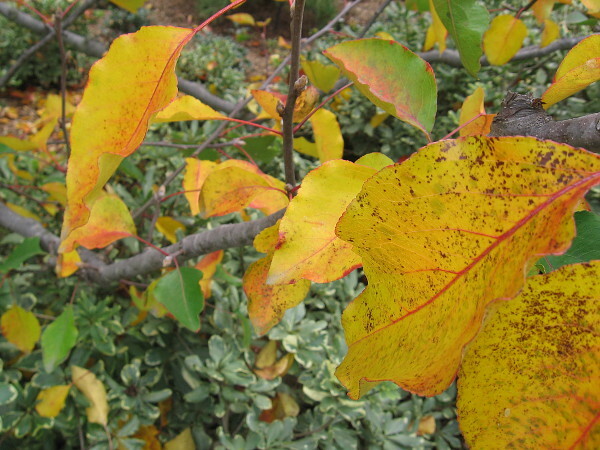 The garden is primarily green–the most relaxing color. A tsukubai basin near the door of the Exhibit Hall. Kneeling humbly, one washes hands before entering a temple. This represents spiritual cleansing. Two long benches inside the Exhibit Hall look out at the carefully arranged Dry Stone Garden. 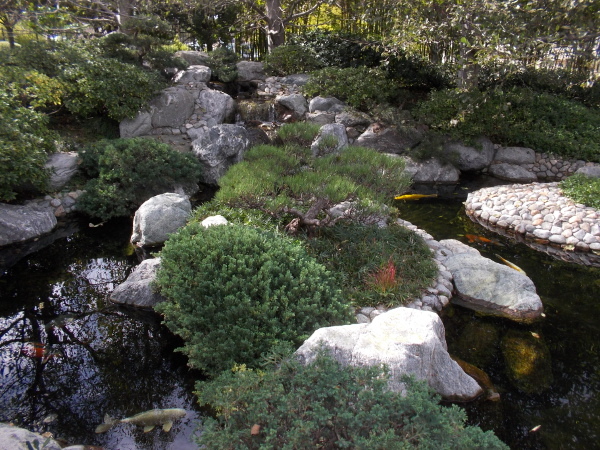 This karesansui invites deep meditation; the stones appear like islands in Japan’s Inland Sea. 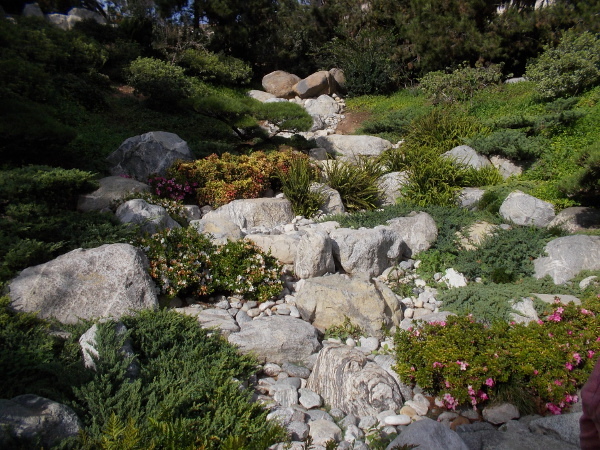 The Dry Stone Garden, in Japanese called karesansui, contains a numerologically auspicious odd number of stones. The stones all seem to bow to a vertical master stone, the first to be placed. The stones float like islands, and the raked ridges around them appear like choppy waves in Japan’s Inland Sea. 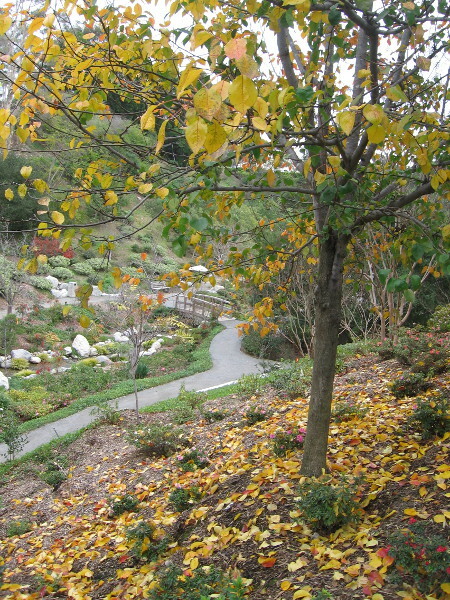 Shrubs behind the rock garden simulate wooded hillsides. The extended roof and garden’s nearness draw the observer into the calm scene. 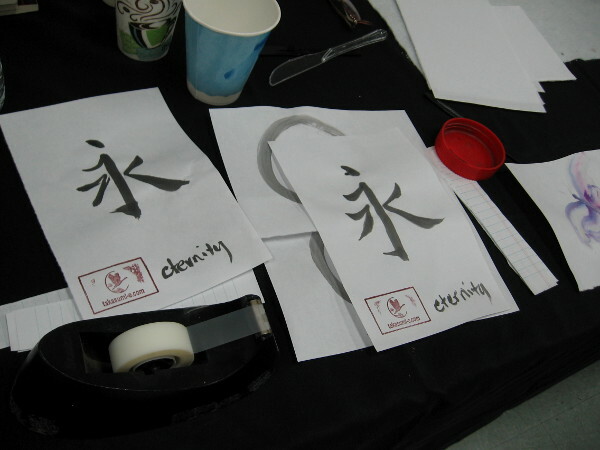 Zen meditation and mental abstraction is sought. 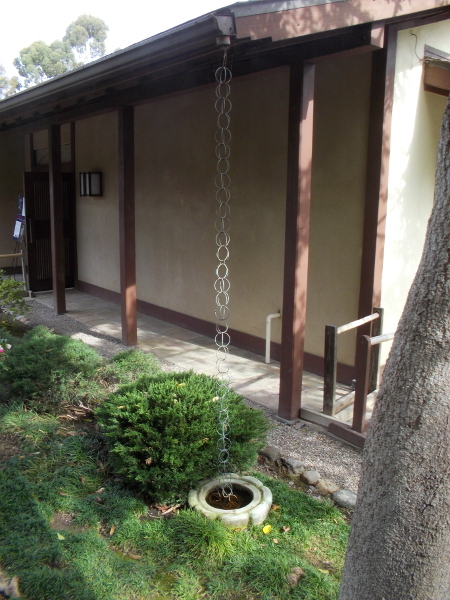 A rain chain at one corner of the Exhibit Hall is used to collect water and provide a pleasing touch to the garden. 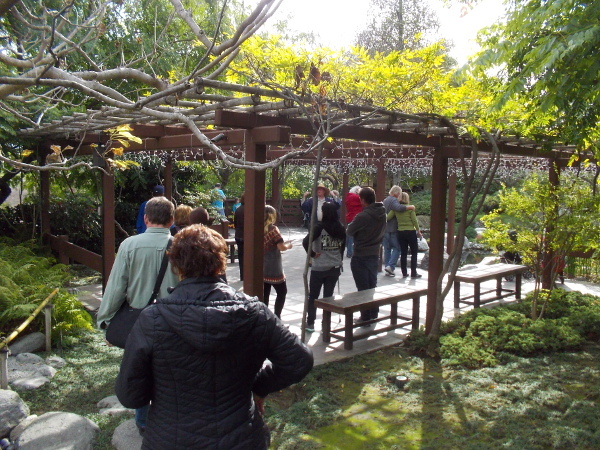 Our group heads on a stone path past a lantern to a patio near the koi pond. Those lights dangling overhead are not typical in a Japanese garden. They were added before Christmas to please Balboa Park visitors who love twinkling lights at night during the holiday season. 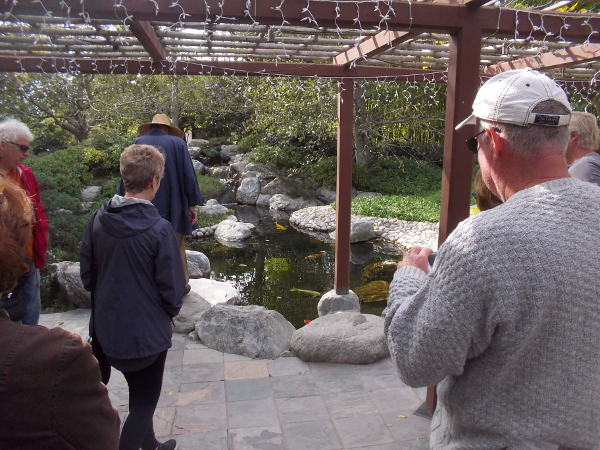 We approach the beautiful, very popular koi pond. We learn about koi, their colors, value and symbolism. They originated in the desert ponds of Iran and are black when found in nature. 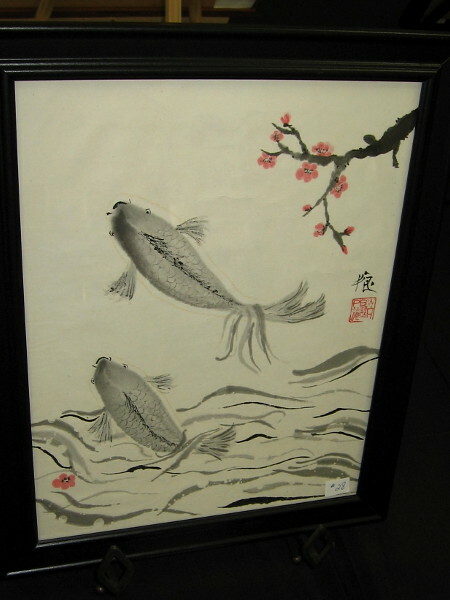 Long-living fish, they are collected by the wealthy and viewed as symbols of longevity. 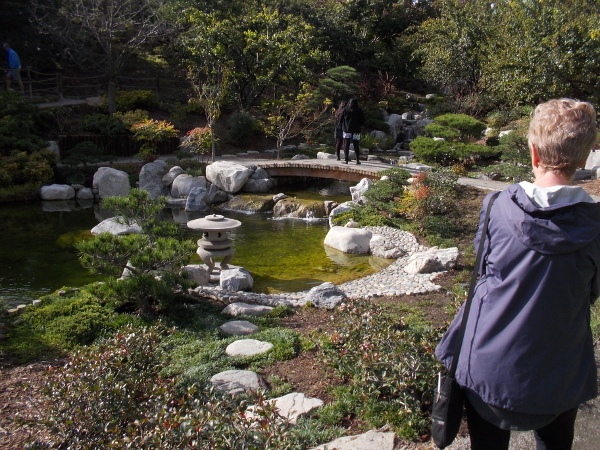 The koi pond and the island in its center are both shaped like turtles. 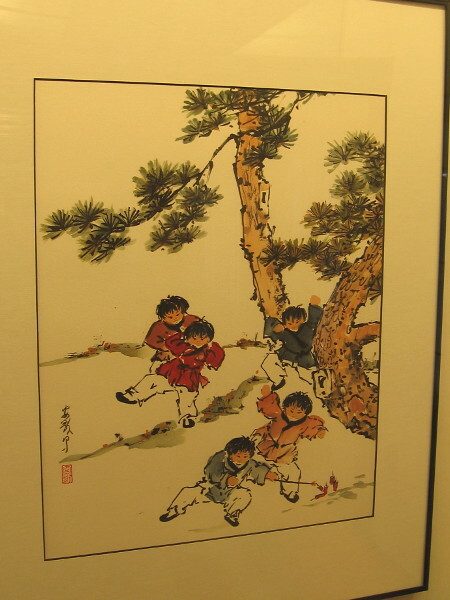 Many subtle and hidden images can be found in a typical Japanese garden. Walking along, feeling peaceful and at one with nature. 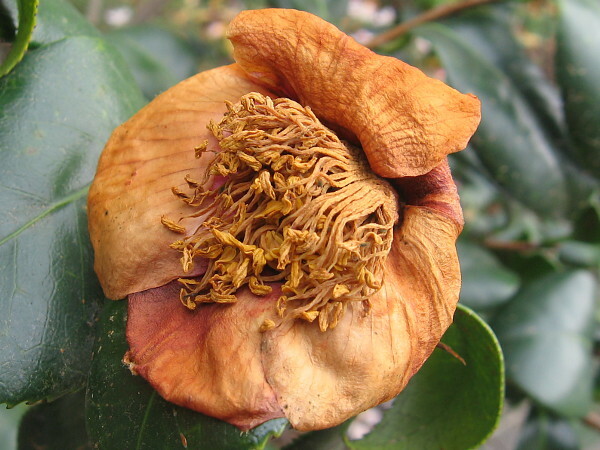 All worldly cares have been left behind. 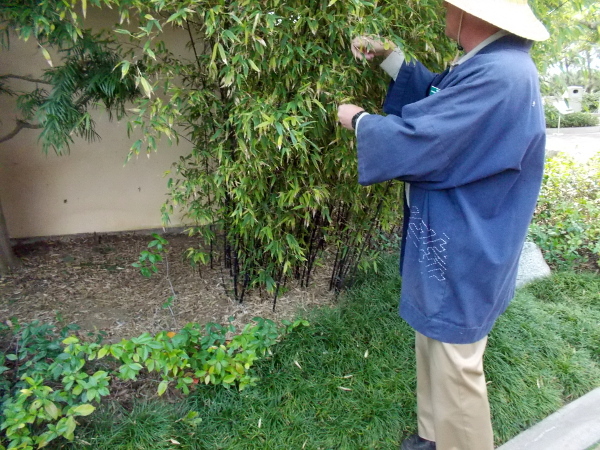 Our docent tour guide shows us some black bamboo. 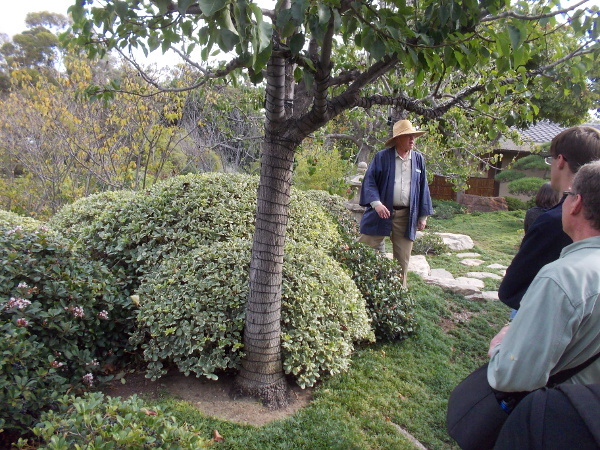 Now we’ve arrived at the bonsai garden. Some of these weathered specimens were acquired on mountaintops and are over 300 years old. 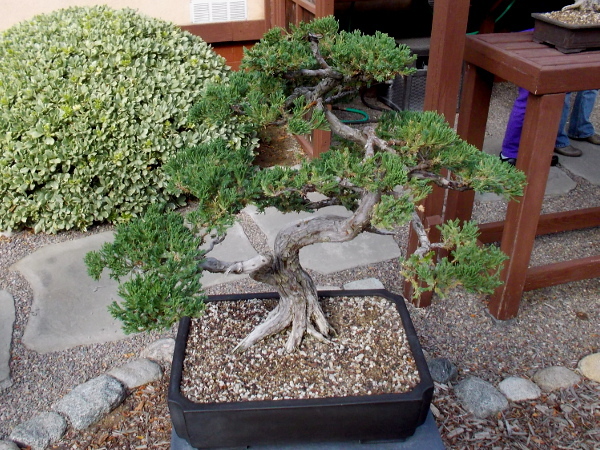 A small juniper has been trained over time to appear like a gnarled tree in the wild. 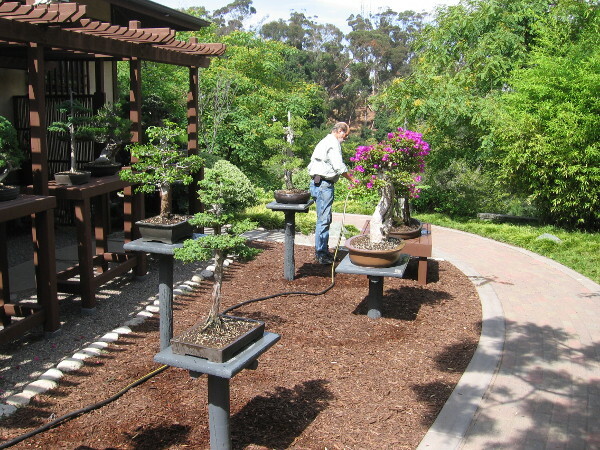 Patience and an eye for beauty are requirements when practicing the Japanese art form of bonsai. 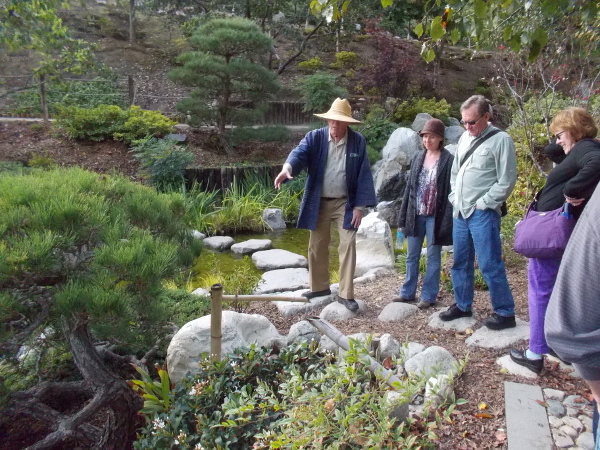 Our tour of the upper level of the Japanese Friendship Garden is almost done. We pause for a moment by the Charles C. Dail Memorial Gate. In a coming blog post, we will pass through the gate and descend into the amazing canyon below to see a river, waterfalls and more! Do you like to read original, thought-provoking fiction? 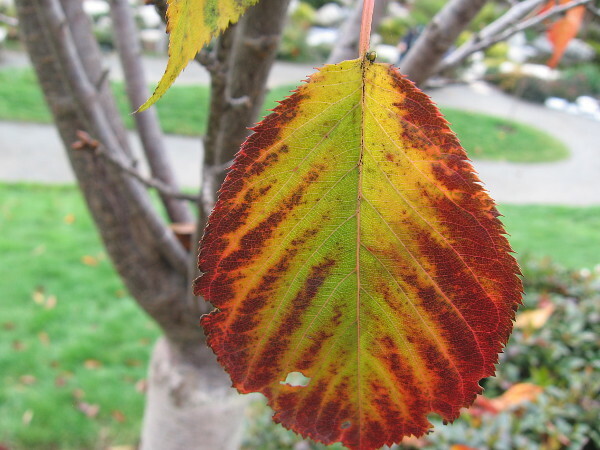 To enjoy a few philosophical short stories that I’ve written, click Short Stories by Richard. 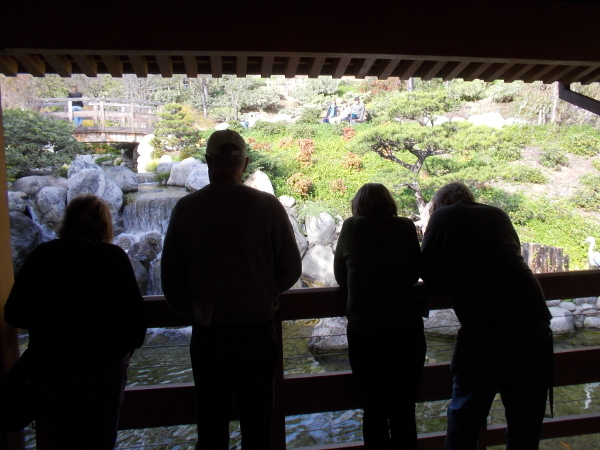 Posted on November 30, 2016 December 11, 2017 Tags balboa park, beautiful, gardening, gardens, japan, japanese friendship garden, nature, philosophy, photography, plants, san diego, tour, travel, treesLeave a comment on Photo tour of Japanese Friendship Garden upper level.